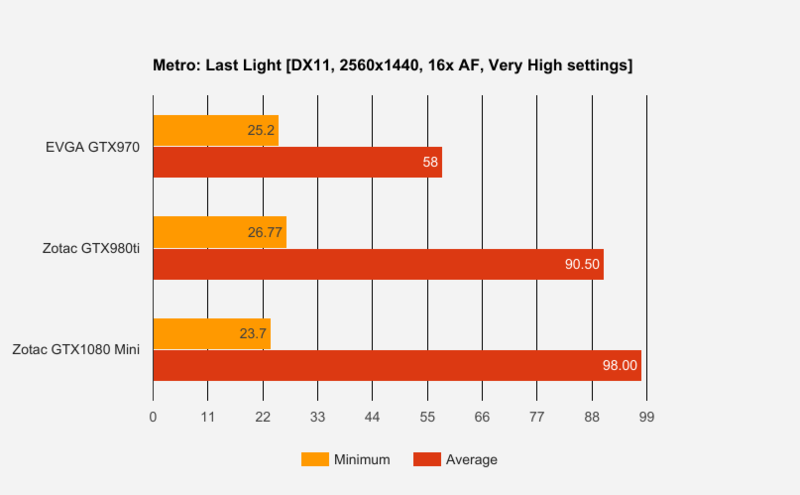 We would like to thank ZOTAC for providing us with a review sample of their ZOTAC 1080 Mini. 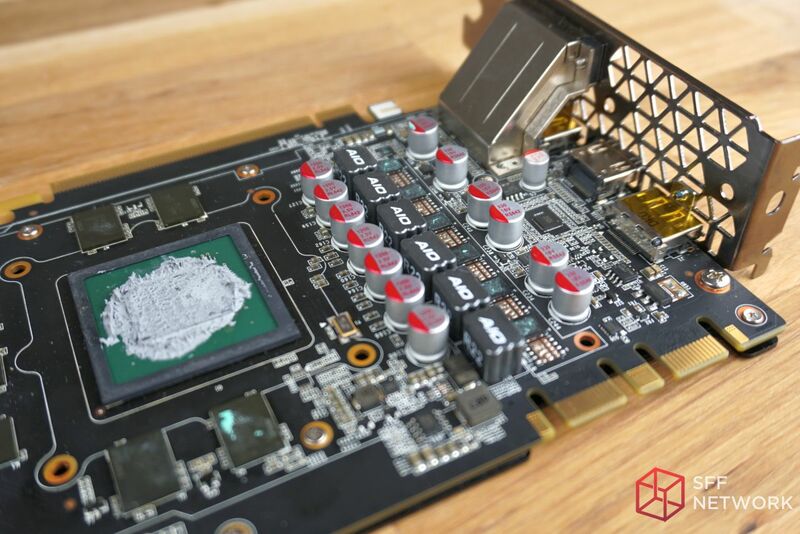 Without their generosity, this graphics card review would not be possible. 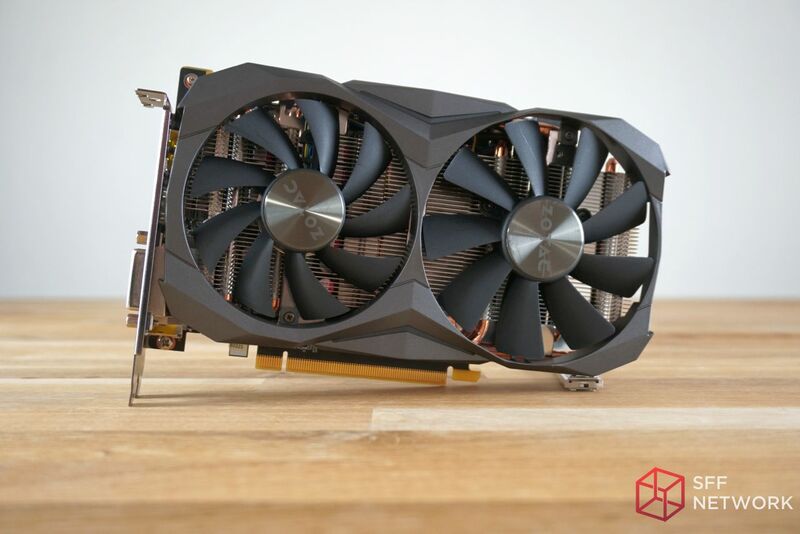 Originally announced back in December of 2016, showcased at CES, and then released in January, the ZOTAC 1080 Mini is the veritable King of graphics cards among SFF enthusiasts. 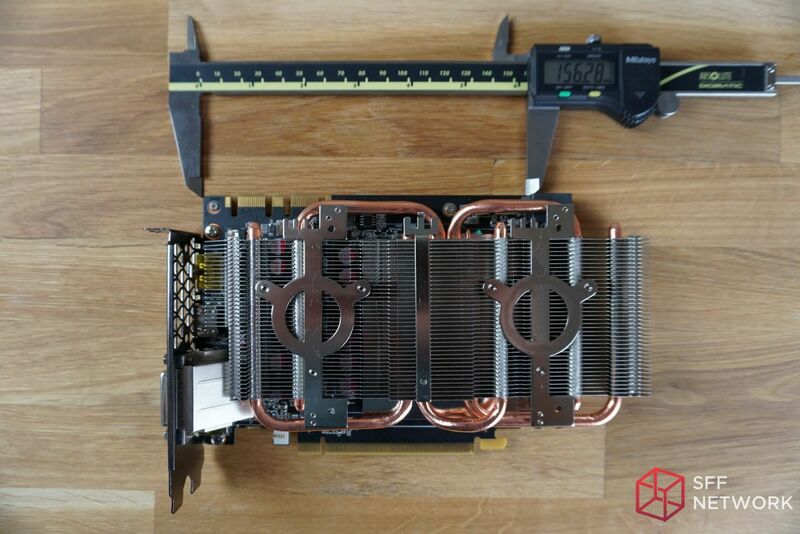 At present, there doesn’t exist a single more powerful GPU capable of fitting into the some of the smallest chassis around. 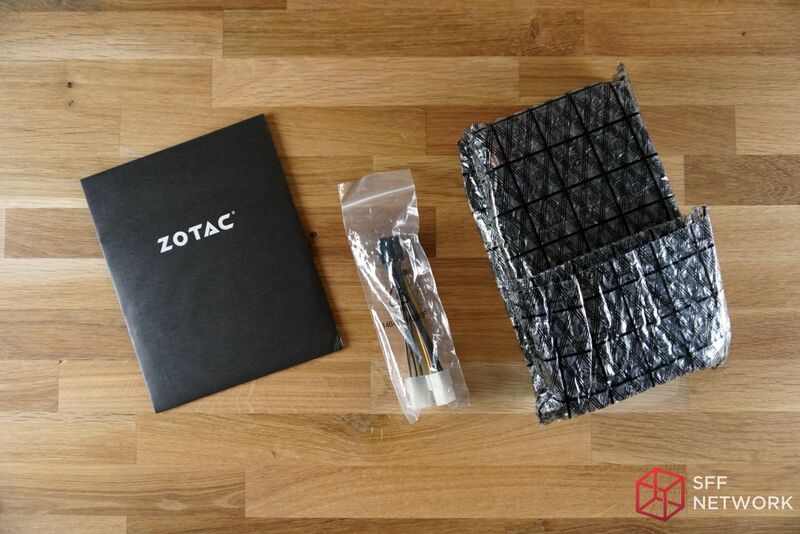 The ZOTAC packaging includes their trademark black and yellow color scheme. Opening up the box we see a rather simple interior with the graphics card adequately surrounded by medium density foam. 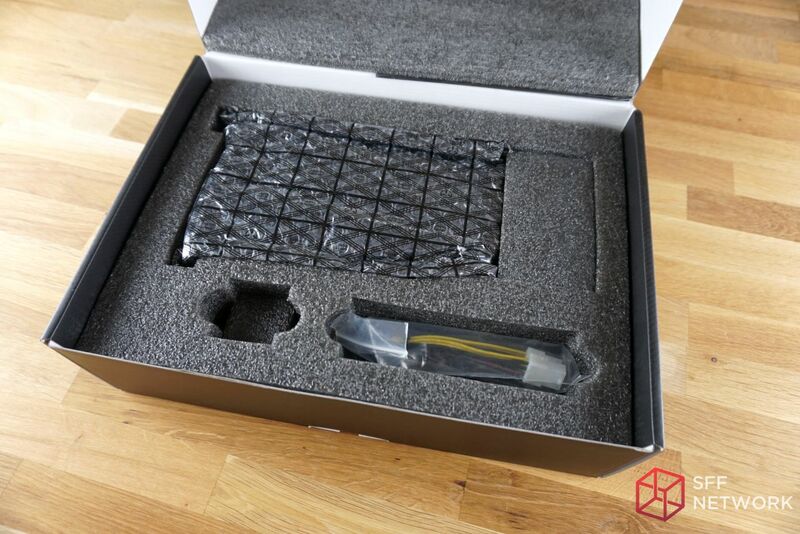 Included inside the box is a ZOTAC branded black envelope, a generic dual 6-pin to 8-pin PCIe adapter, and the ZOTAC 1080 Mini neatly secured inside a bubble-wrap lined anti-static bag. 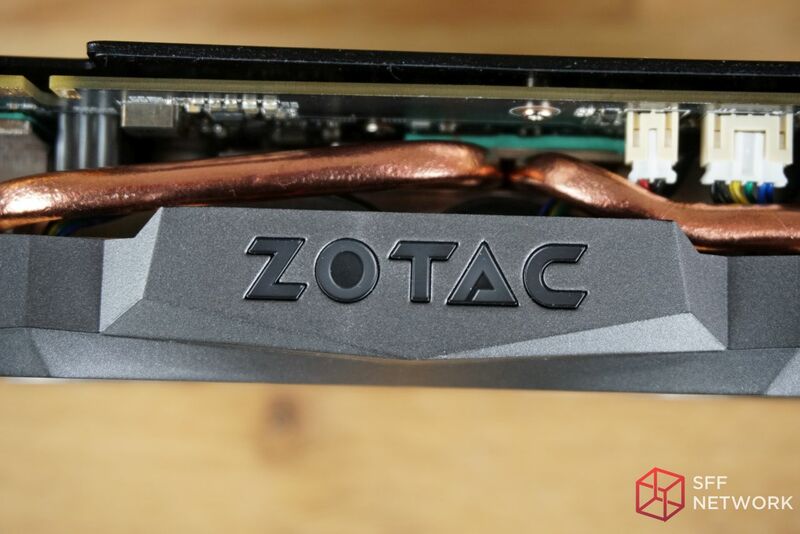 A premium (thick metal) ZOTAC case badge. A CD that includes graphics drivers, the ZOTAC Firestorm overclocking software, and user Manual. 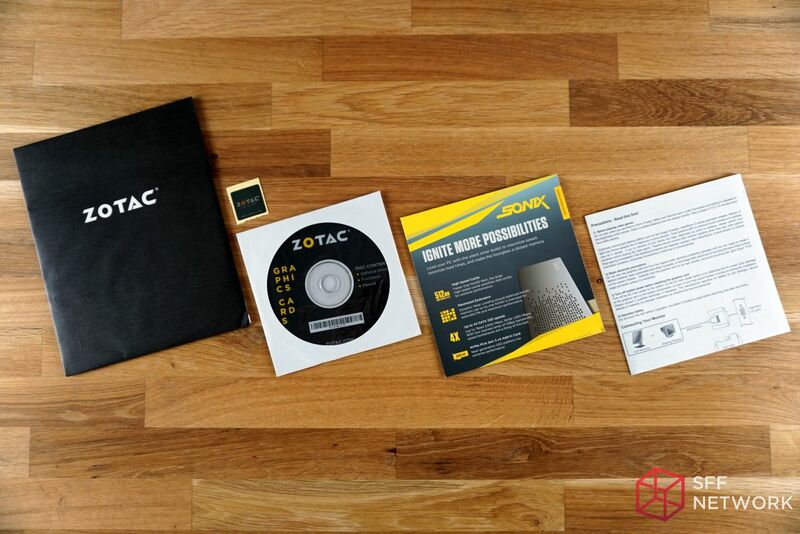 Advertising material for various ZOTAC product such as their low-profile ZOTAC Sonix PCIe SSD. 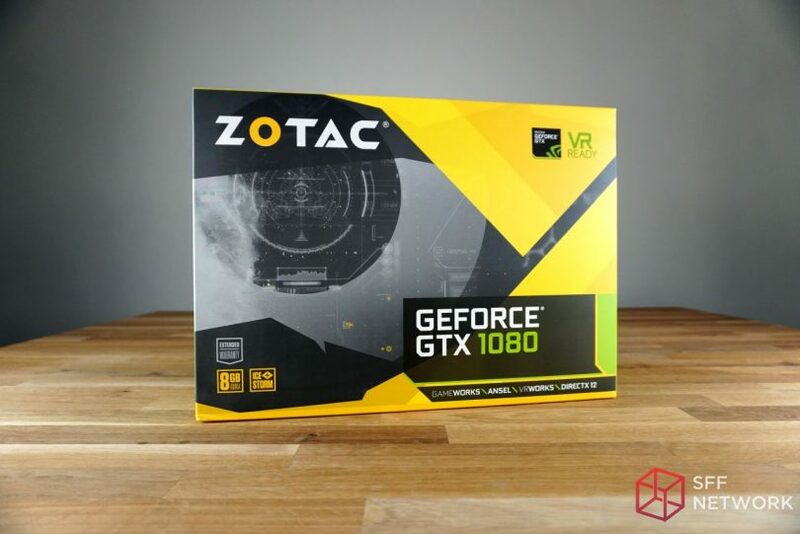 As touted on their landing page, ZOTAC has listened to their loyal fanbase and they have produced a slick looking graphics card that will look right at home in any computer. You really cannot go wrong with the understated gunmetal and black theme that they have chosen. As mentioned in the specifications, the rear IO consists of 3 x DisplayPort 1.4, 1 x HDMI 2.0b, and 1 x DL-DVI. The PCI slot cover is also well ventilated with a unique pattern of triangles to optimize airflow without compromising rigidity of the bracket. 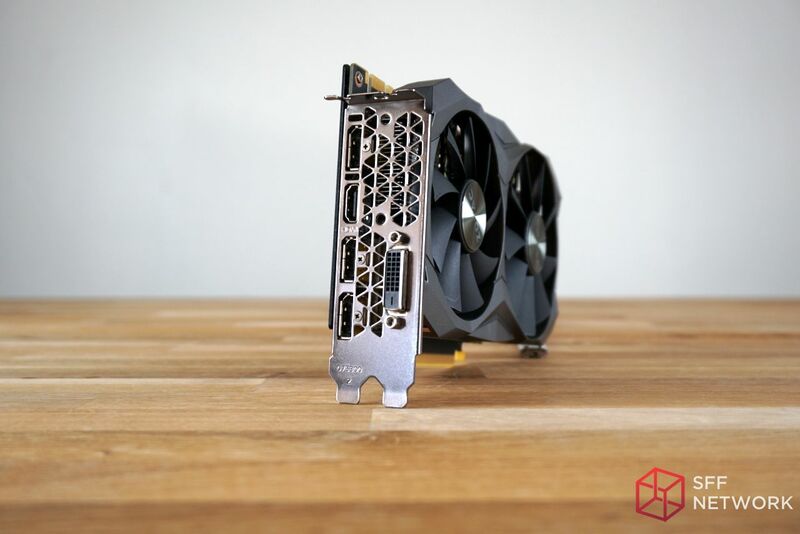 The back of the graphics card includes a stylish matte black aluminum backplate that is well ventilated and mounted to the PCB on standoffs. 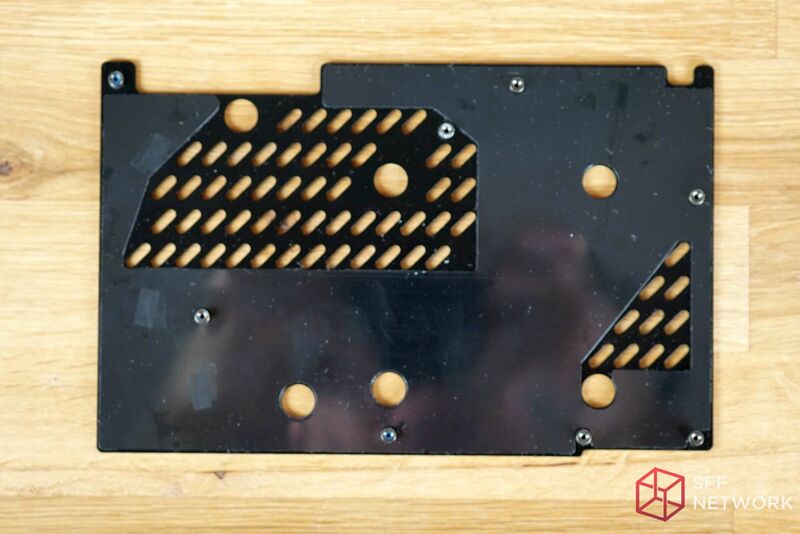 As we have seen in the past, an improper backplate would rest directly atop the PCB trapping in the heat- that is definitely not the case here. 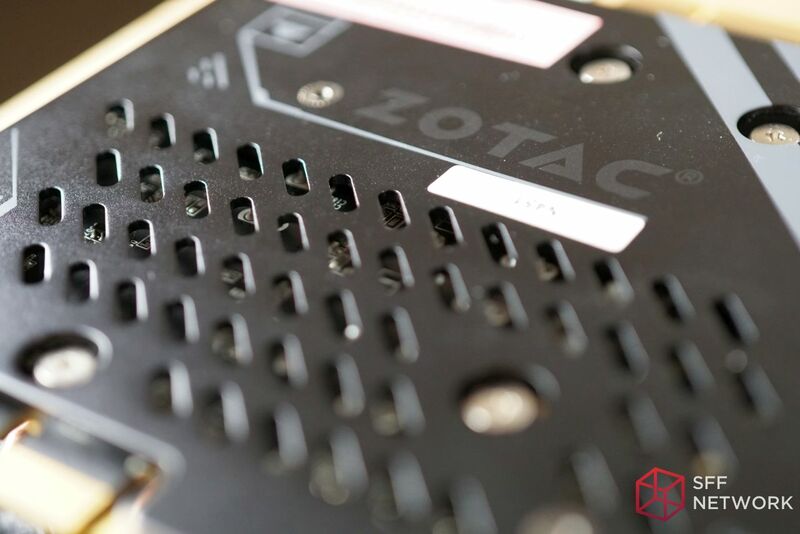 ZOTAC was smart to included decently sized gap between the PCB and the aluminum backplate, we’ll touch more on that later. 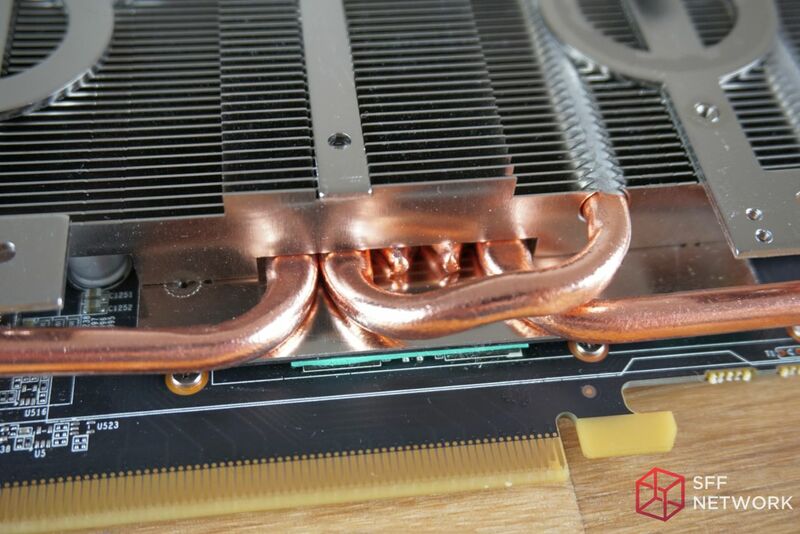 Visible here are the series of copper heatpipes that assist in keeping the GPU cool. 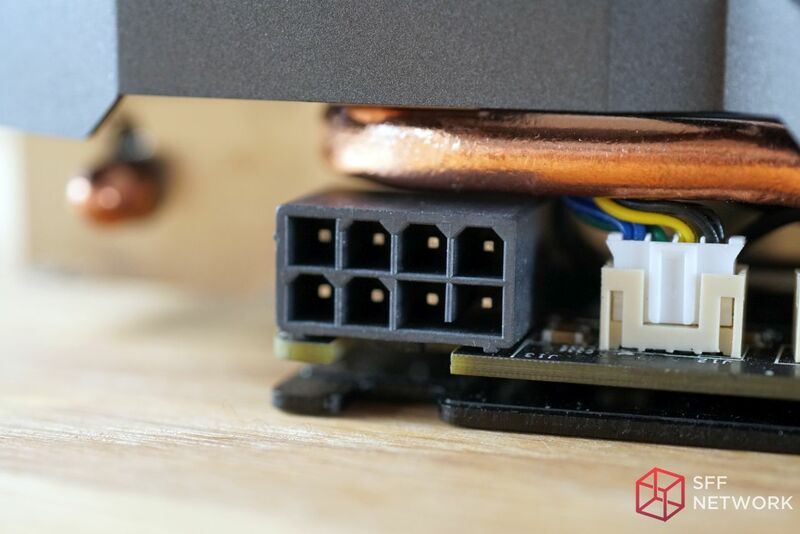 The 8-pin PCI power connector features a cutout to help make removal of the PCIe power cable that much easier. 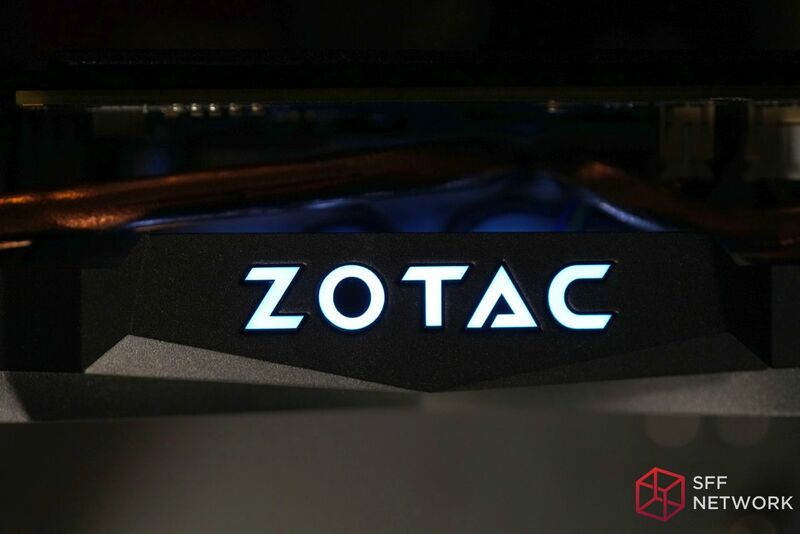 When the graphics card is powered on, the ZOTAC logo lights up in a soft white color that is evenly lit and not overbearing. The 90mm, 9-blade fan (below, left picture, left fan) is designed for higher static pressure. 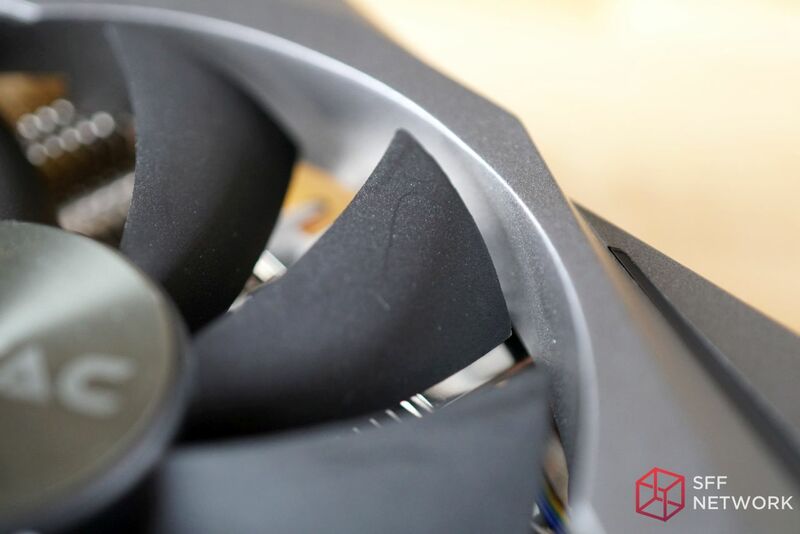 The 100mm, 9-blade fan (below, right picture, right fan) is designed for a higher volume of airflow. You can really tell the difference between the two blade profiles in the following picture. Looking at the bottom of the heatsink we can see the flawless placement of the aqua colored thermal pads atop the memory modules. Here you can get a nice feel for the smooth finish of the aluminum backplace as well as the gap between it and the PCB below. 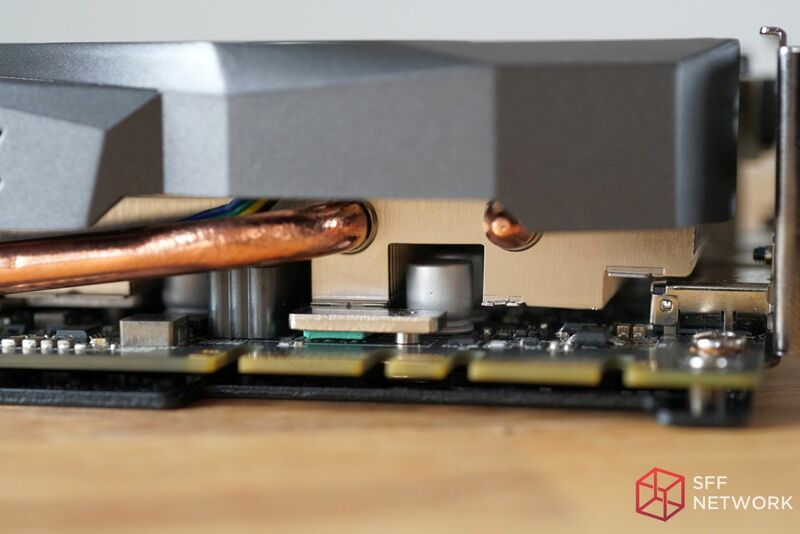 Showcasing some nice attention to detail, here you can see that the aluminum heatsink goes around the components on the PCB, touching only the components it needs to. The highlight of this picture was supposed to be, “Yup, that’s an 8-pin power connector” but would you just look at the texture in the plastic shroud? It has a very fine graininess to it that feels good to the touch. 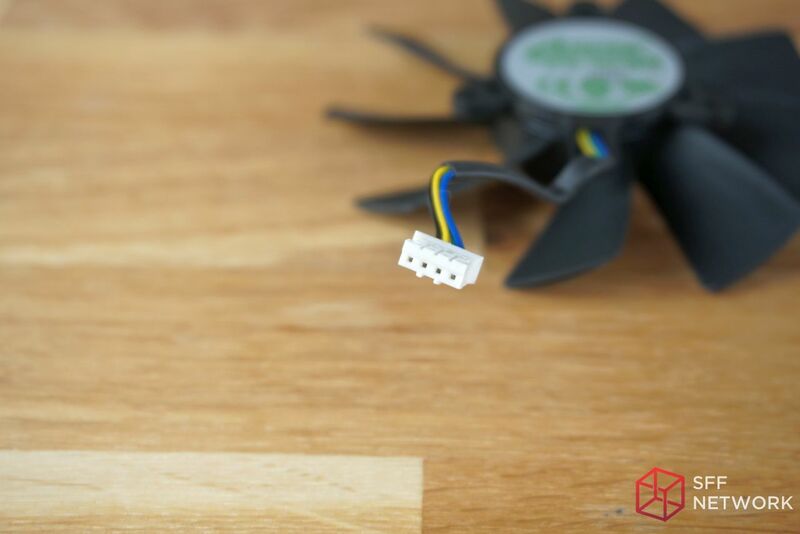 The left connector powers the two fans. 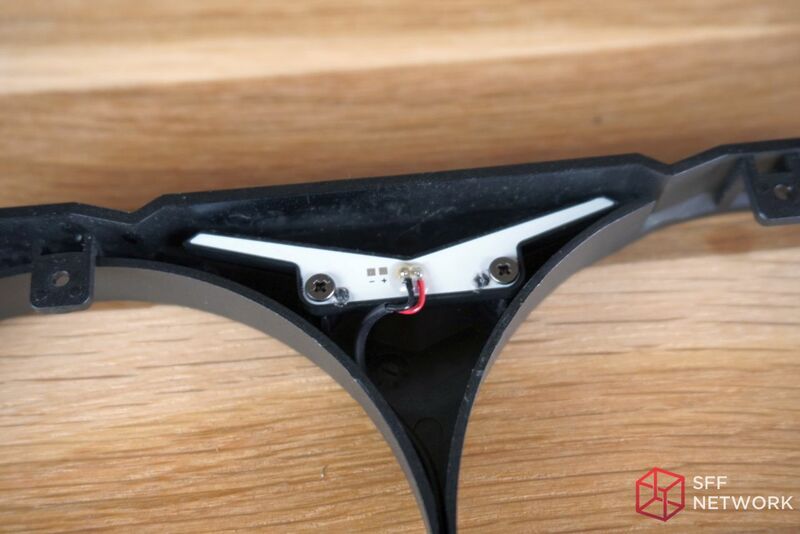 The right connector powers the small handful of white LEDs in the plastic shroud. The left fan is accurately listed as a 90mm fan. The right fan is accurately listed as a 100mm fan. 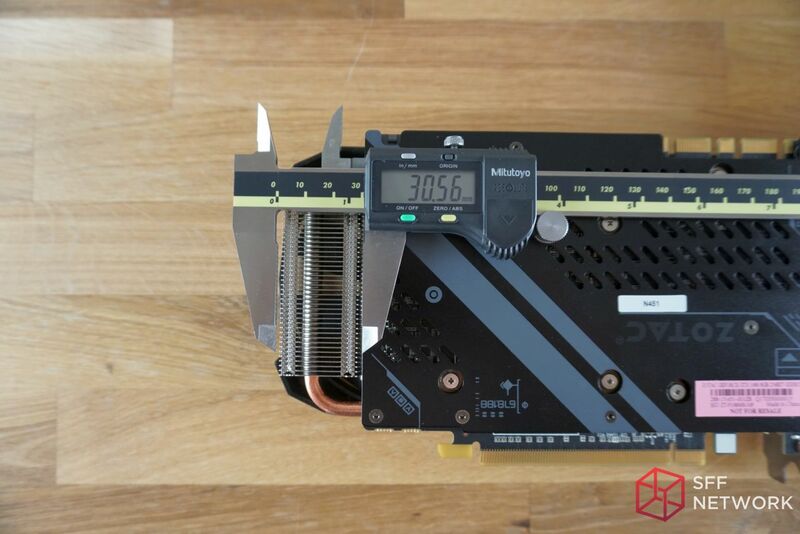 The overall thickness of the card, with the stock shroud and fans, is a little over 40mm. 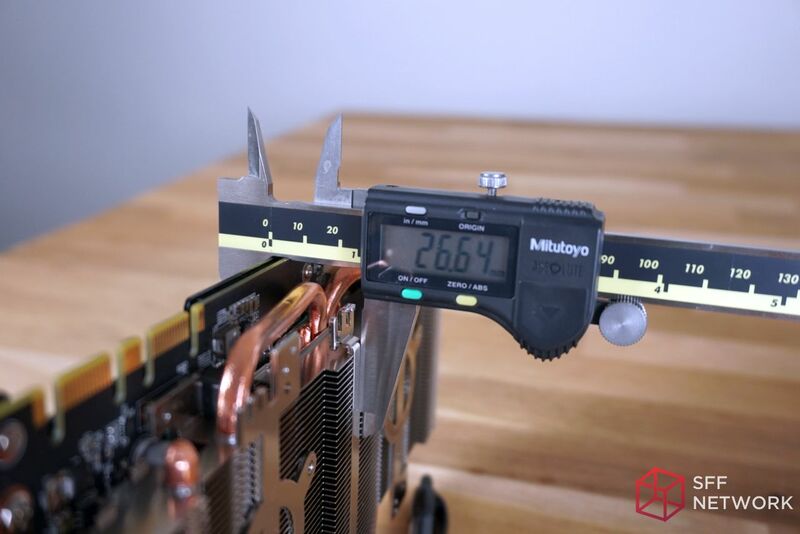 The PCB of the GTX 1080 Mini is an impressive 173mm in length. 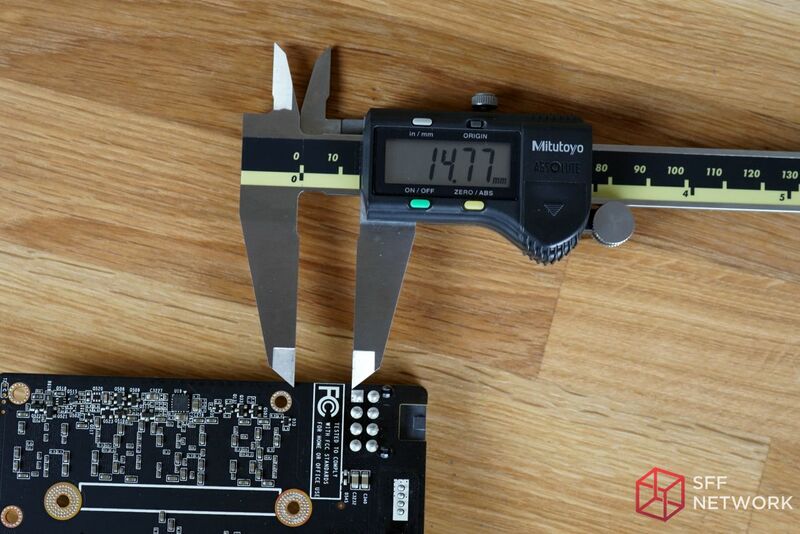 The height of the PCB matches the aluminum backplate at just 110mm. 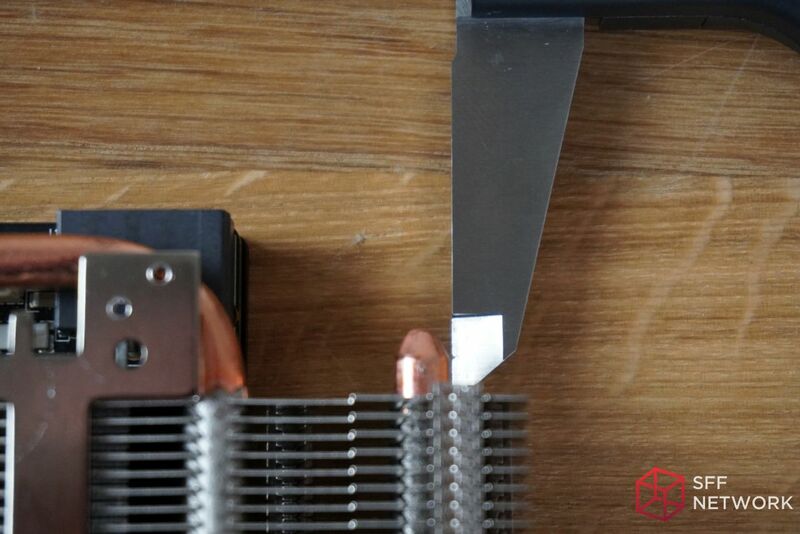 The high density aluminum fins at the end of the heatsink stick out an additional 30mm from the PCB. 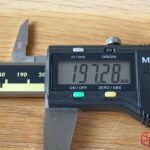 Note: The angle of this photo makes it look like it’s not being measured correctly. Rest assured that I fixed that little hiccup with the next photo. 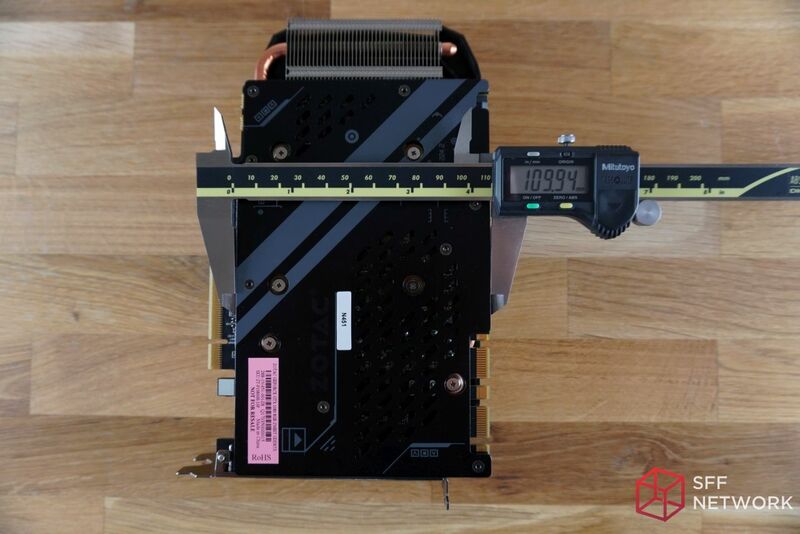 Including the plastic shroud, the heatsink sticks out from the PCB just a little over 35mm. 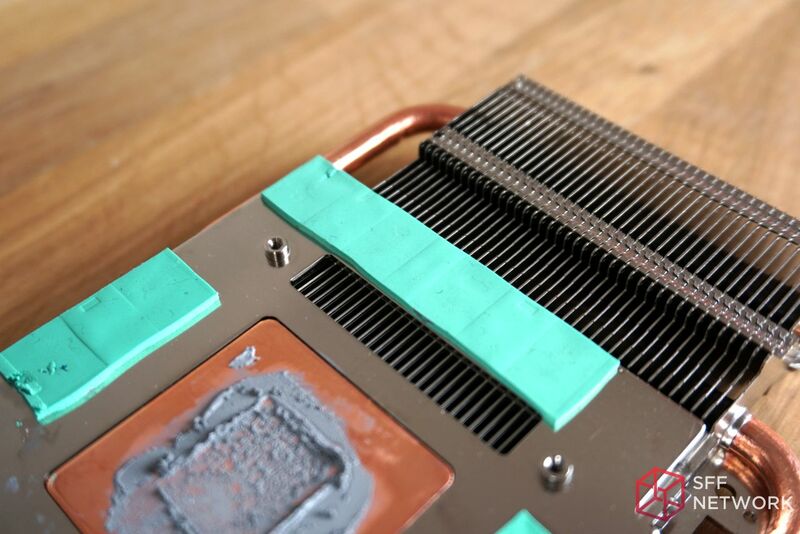 The copper heatpipes used to distribute heat are 6mm thick, just as the advertising material said. 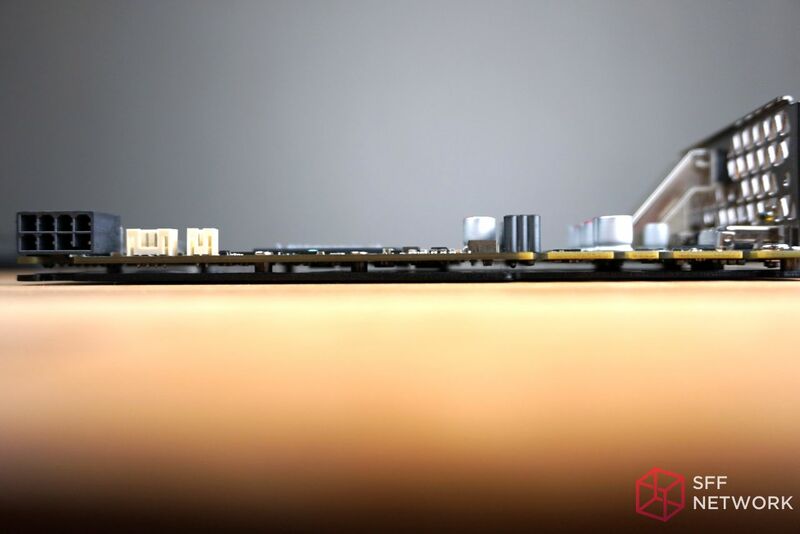 The aluminum backplate is 1.5mm thick. 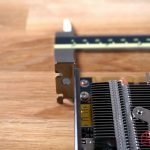 This may not matter to most but if you require the removal of this backplate to fit the GPU into your chassis, there ya go! 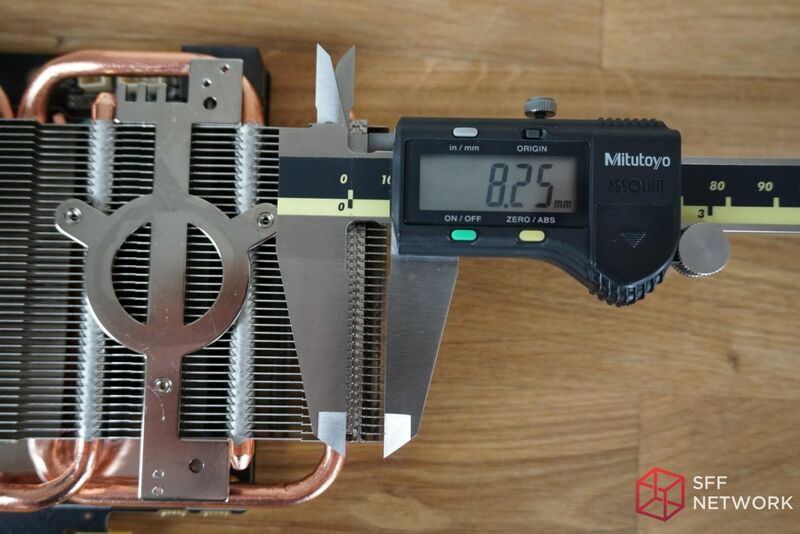 With the stock shroud and fans removed, the GPU is just 26.64mm thick. If you absolutely need to cut this card down to fit it into your case, and are willing to void your warranty, you can safely use a Dremel tool to cut off 8.25mm of the excess aluminum. 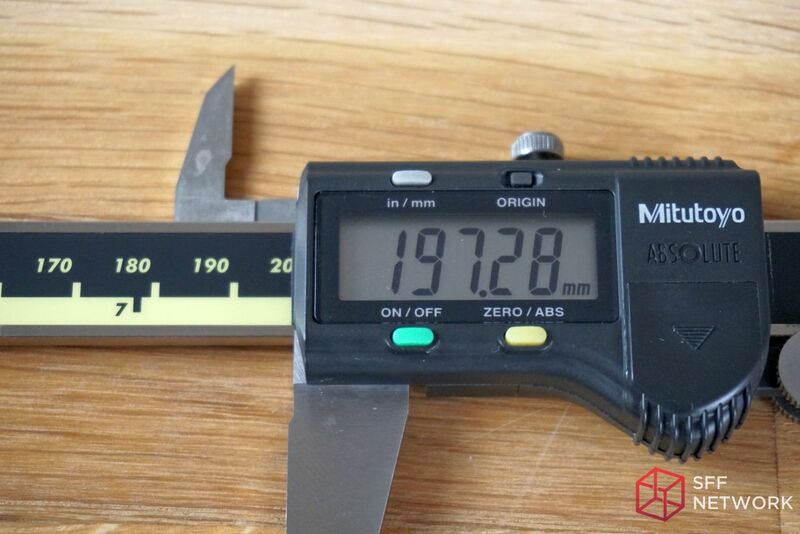 Measuring flush from the rear bracket to the end of the last copper heatpipe, I ended up with 197.28mm in length. 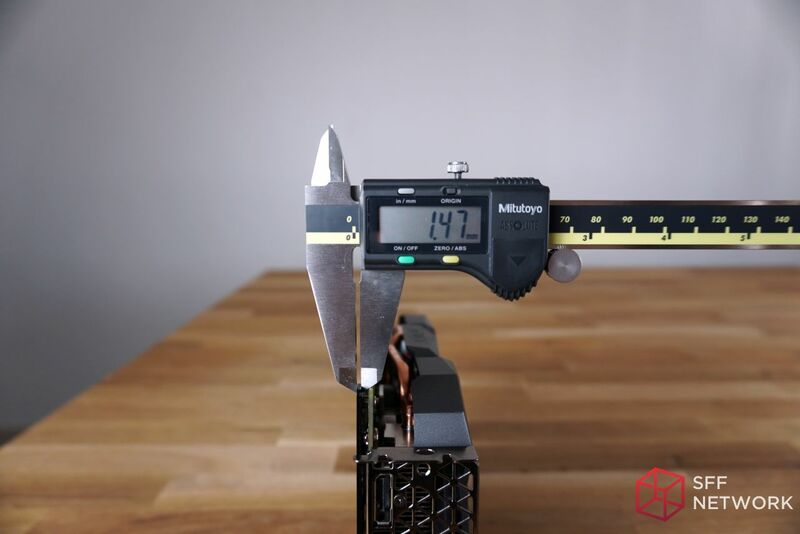 From the bottom of the PCI bracket to the top of the PCB, the card is 137.91mm in height. The beginning of the 8-pin power connector is located 156.28mm from the back of the PCI bracket (not the PCB). 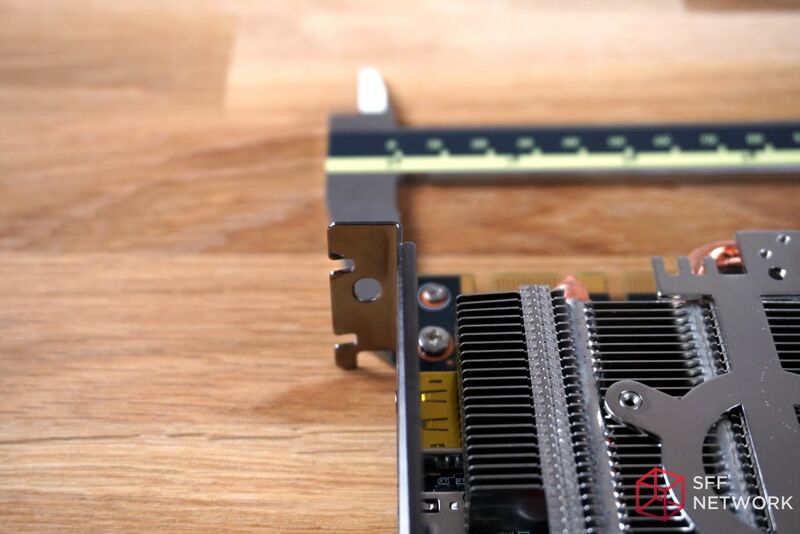 The end of the 8-pin power connector is located 176.83mm from the back of the PCI bracket (not the PCB). 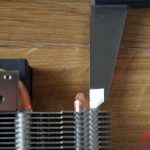 For anyone brave enough to cut off that last copper heatpipe, flush to the tip of the 2nd to the last heatpipe, the card would measure roughly 180mm in length. 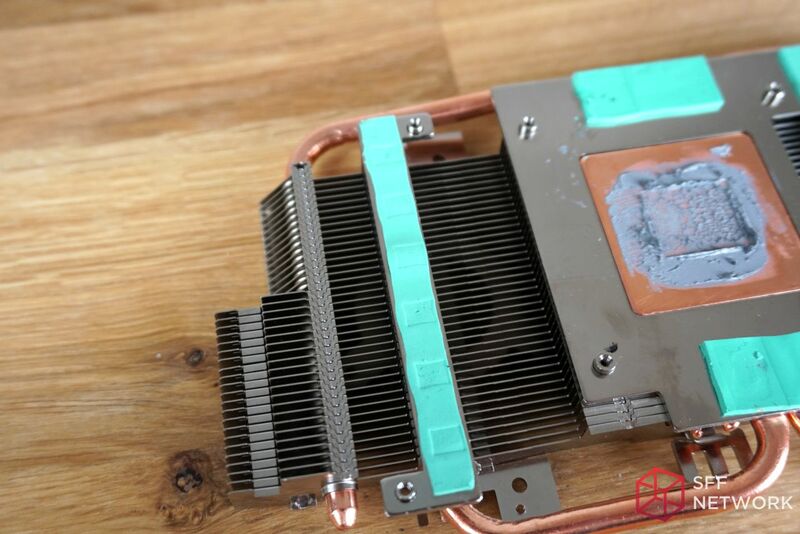 Just don’t expect to use the plastic shroud and fans after making this mod. There are 4 small screws that keep the plastic shroud attached. Each fan is held in place by 3 small screws. Here you see the mounting points for the shroud and the fans. If you look closely, you can also see the guides that protrude outwards (near the top) to help keep the fan and LED cables neatly organized. It’s a really nice touch that some other manufactures would have ignored. 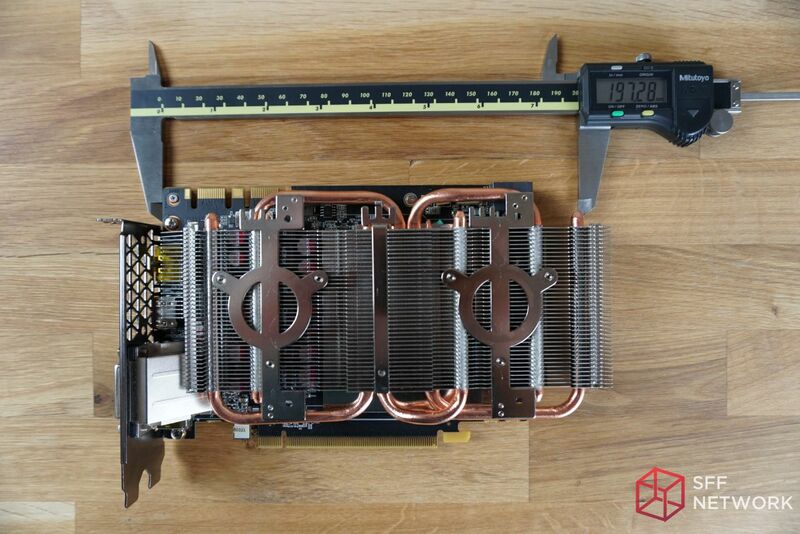 Note: To separate the shroud and fans from the graphics card, the heatsink needs to be removed. 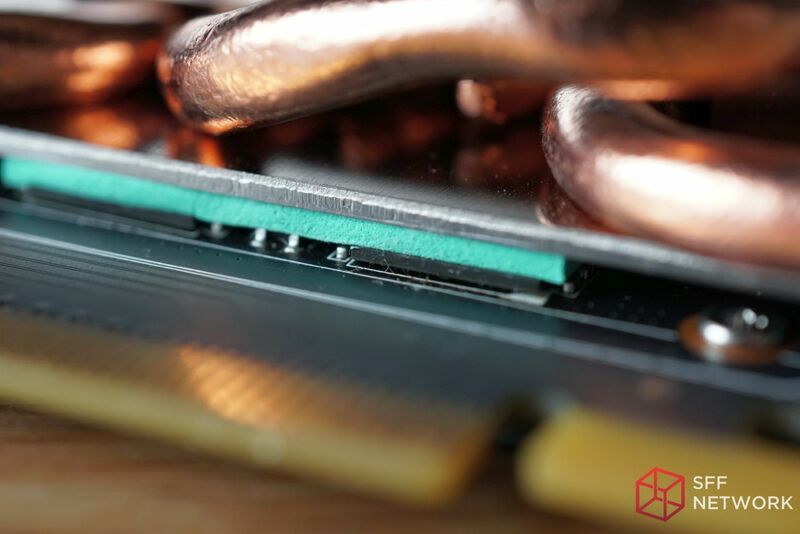 Here you can see the 5 meticulously crafted copper heatpipes that are flattened and then sandwiched into the aluminum heasink. Here is a closeup of the cables that provide power to the LEDs in the shroud. 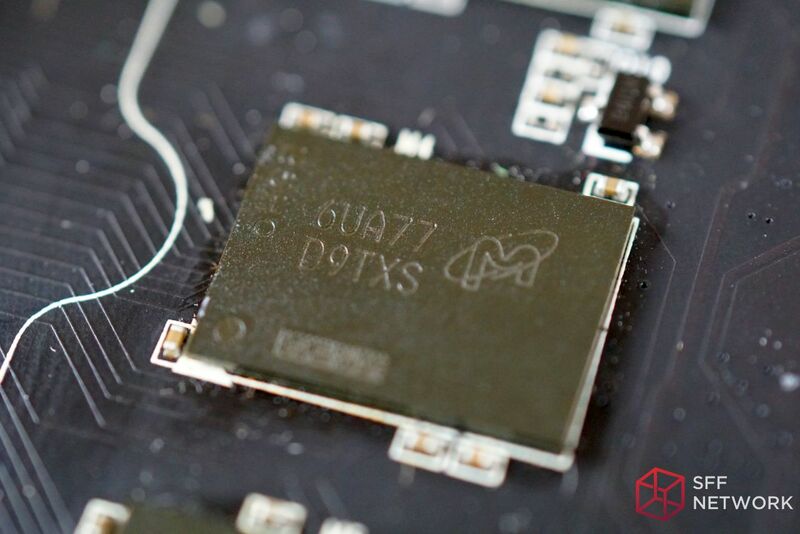 It’s neatly glued to the PCB to prevent the metal from oxidizing and becoming brittle. 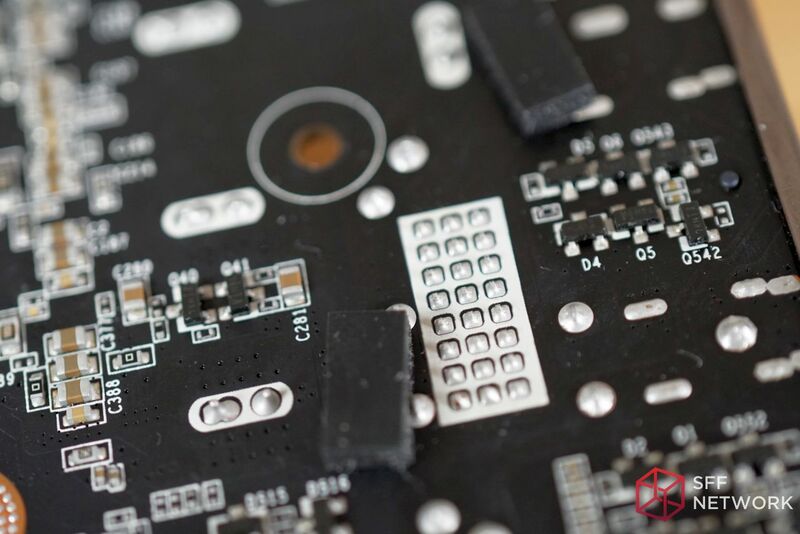 The LED connector cannot be removed without first removing the entire heatsink from the PCB. 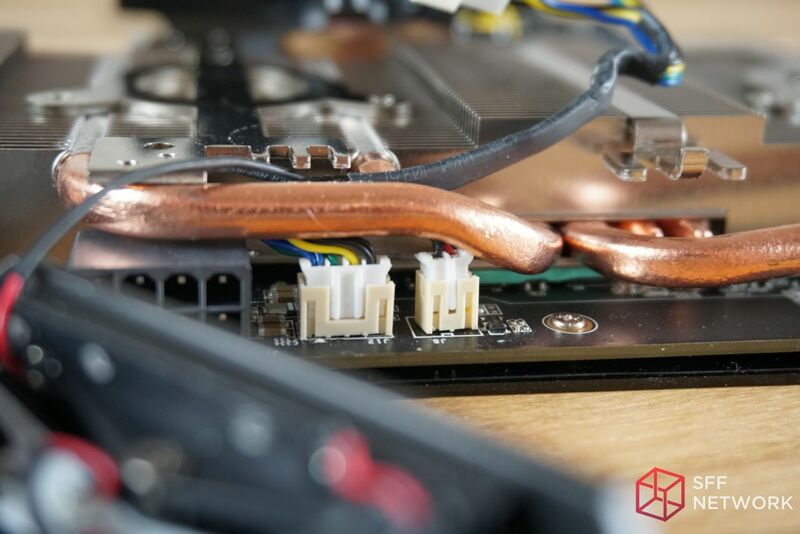 In fact, the removal of either connector requires the heatsink to be removed. 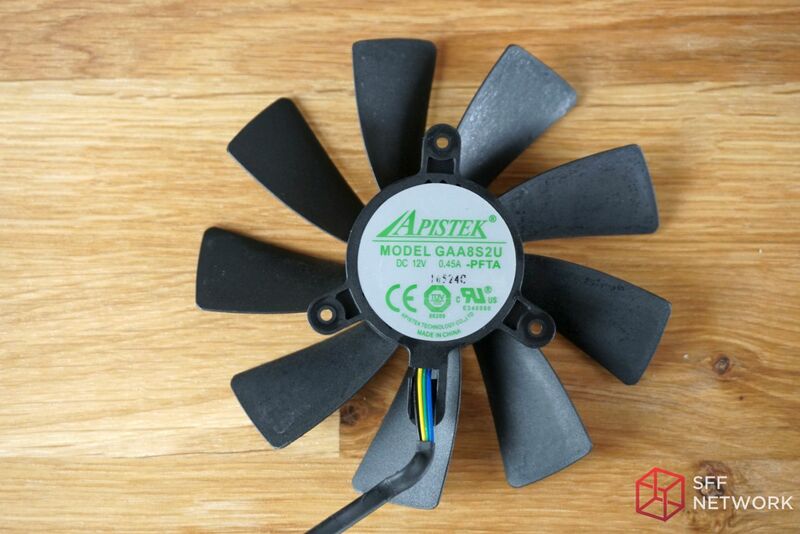 The 100mm fan is an Apistek GAA8S2U. I couldn’t find much information about it but I believe that it is a sleeve bearing fan. The sticker reads DC 12v 0.45A. 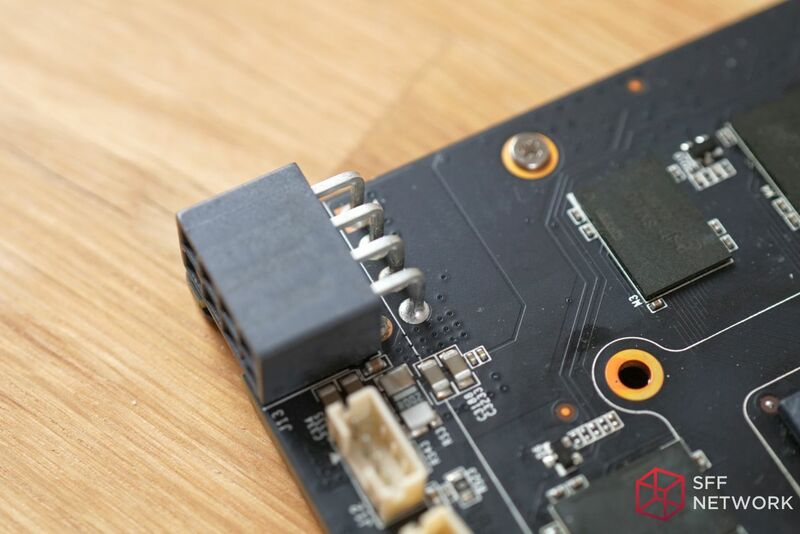 As you might have already noticed, it connects to the PCB using a 4-pin fan header for PWM control. 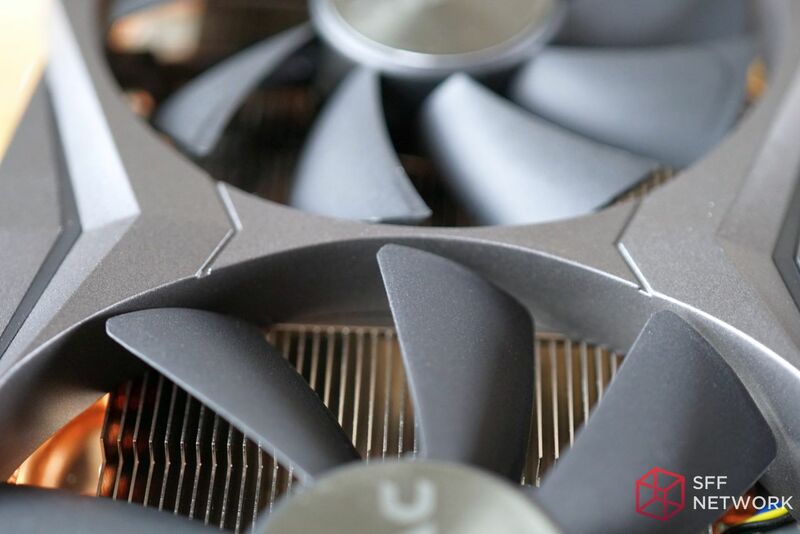 I’ll mention it now, for anyone that might overlook it later, but the fans on this GPU are always on. They are extremely quiet during operation, but none the less they are always on, unlike other Pascal based GPUs. 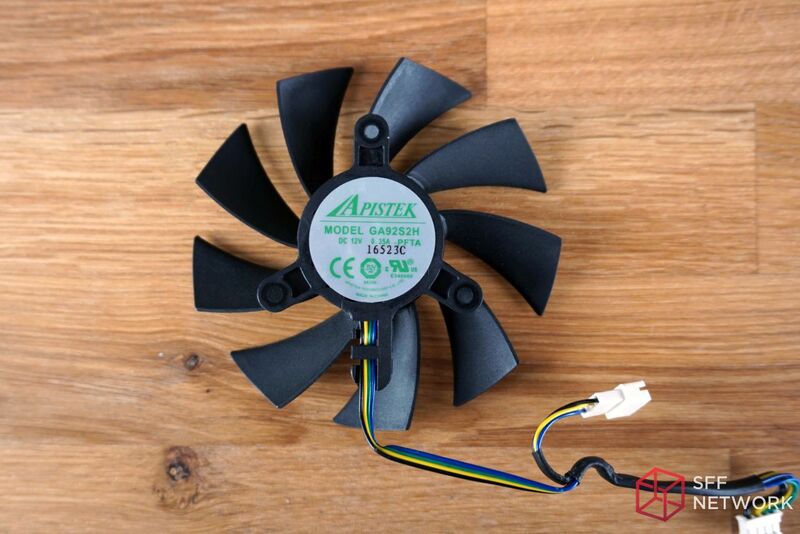 The 90mm fan is an Apistek GA92S2H. I couldn’t find much information about this fan either, but I believe that it too is a sleeve bearing fan. The sticker reads DC 12v 0.35A, 0.10A less than the 100mm fan. Here we can see the high density of electrical components stacked neatly at the back of the card. Here you can see the decently sized gap between the backplate and the PCB (this is a good thing). 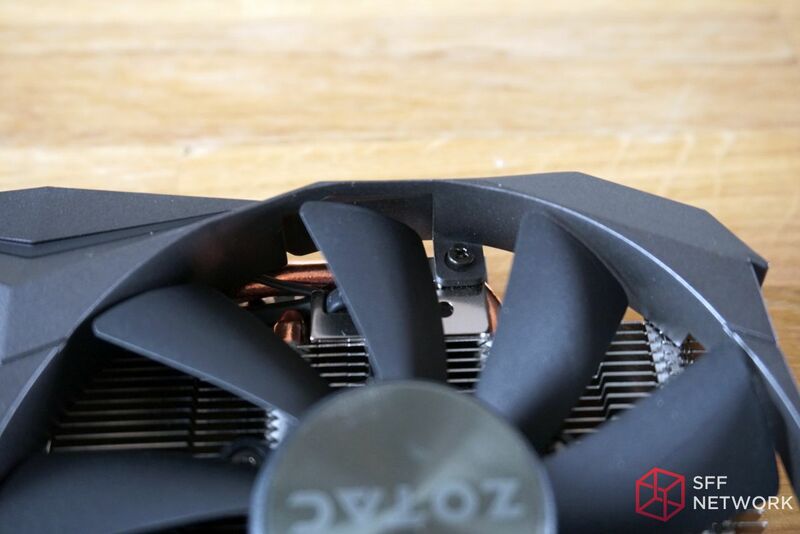 The aluminum backplate on the ZOTAC 1080 Mini has a thin plastic shroud adhered to the backside to prevent an electrical short, and possibly heatsoak, from occurring. The thermal pads are strategically placed to cool the MOSFETs and each of the eight(8) 1GB DDR5X memory modules. 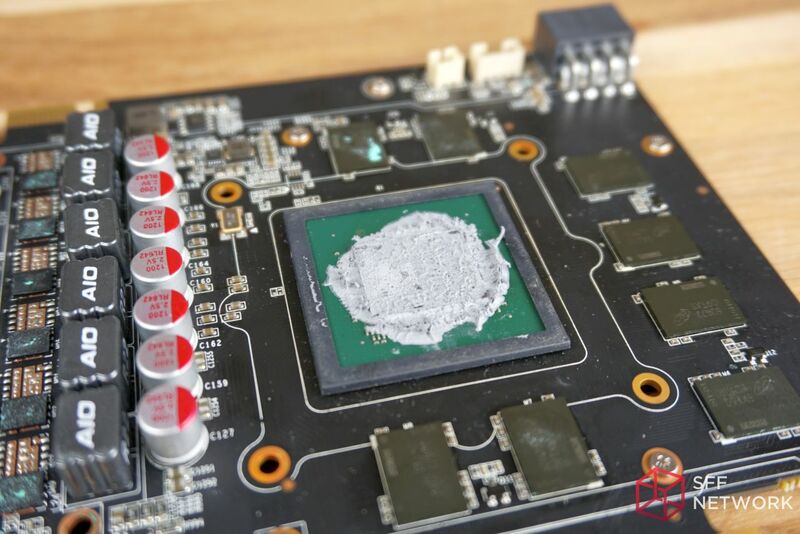 There is more than enough thermal interface material applied to the GPU. 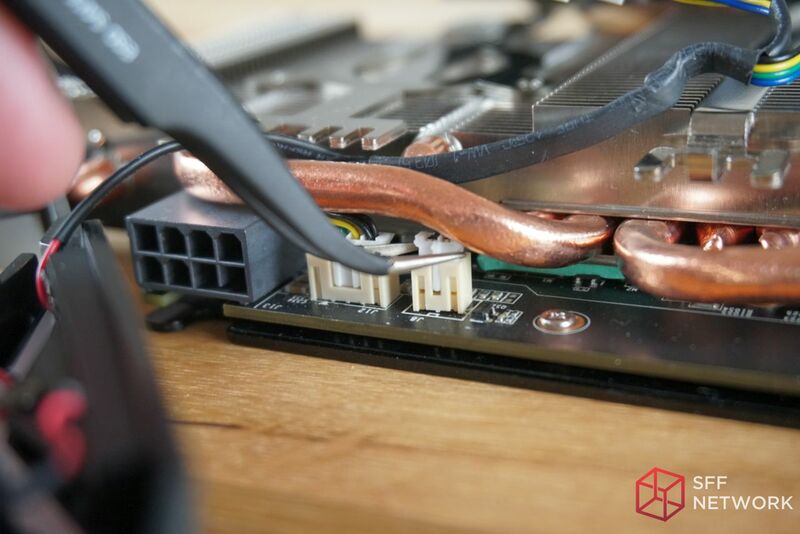 The heatsink uses a copper base to help pull heat off the GPU, directly into the 5 heatpipes sandwiched on the other side. 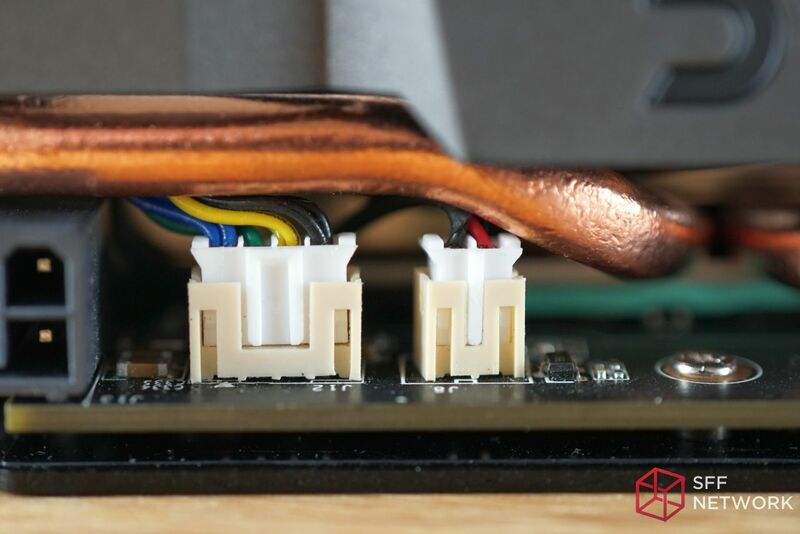 Here we can see that the thermal pads have an even amount of pressure being applied to the MOSFETs to ensure proper heat transference. 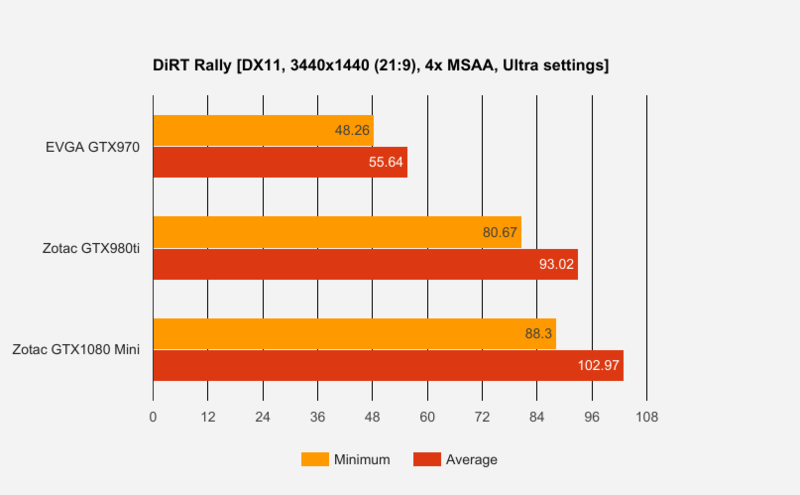 The thermal pads for the GDDR5x memory ICs are also evenly distributed. 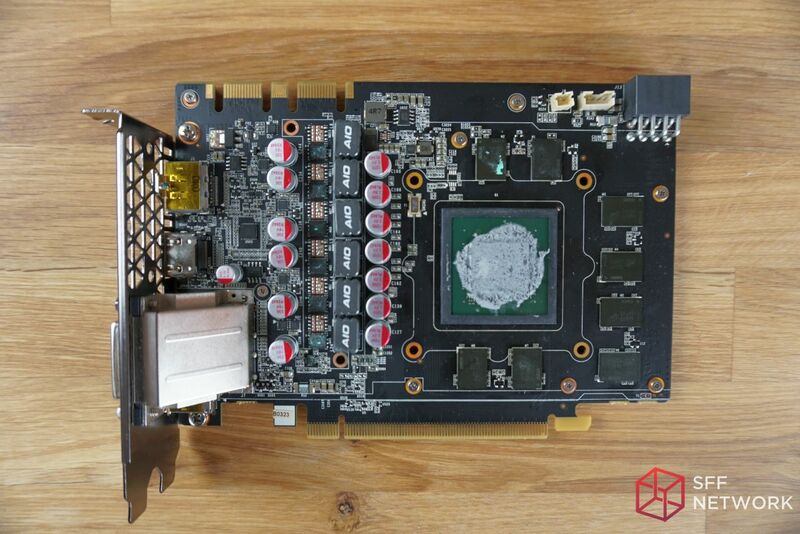 In a 5+1 phase design (matching the power delivery of NVIDIA’s founders edition GPUs), each R22 choke has its own mosfet. The 4R7 choke near the top could possibly be used for the memory but I’m no engineer, so this is just a guess on my part. The memory being used is Micron’s D9TXS which decodes to MT58K256M32JA-100. 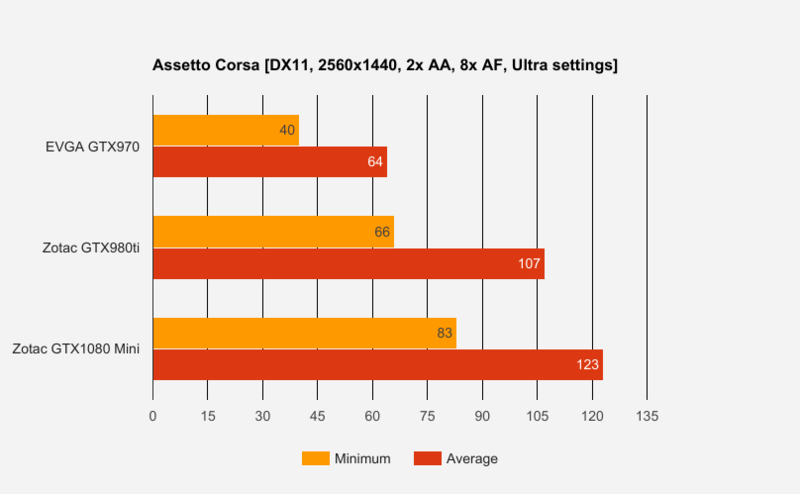 They are specified to run at 1250 MHz (10 GHz GDDR5X effective). The R22 chokes have a very unique shape to them. I’m curious if this design helps to prevent coil whine or if it’s just a look AIO (A10?) has chosen. I’m used to seeing them as bland cubes. 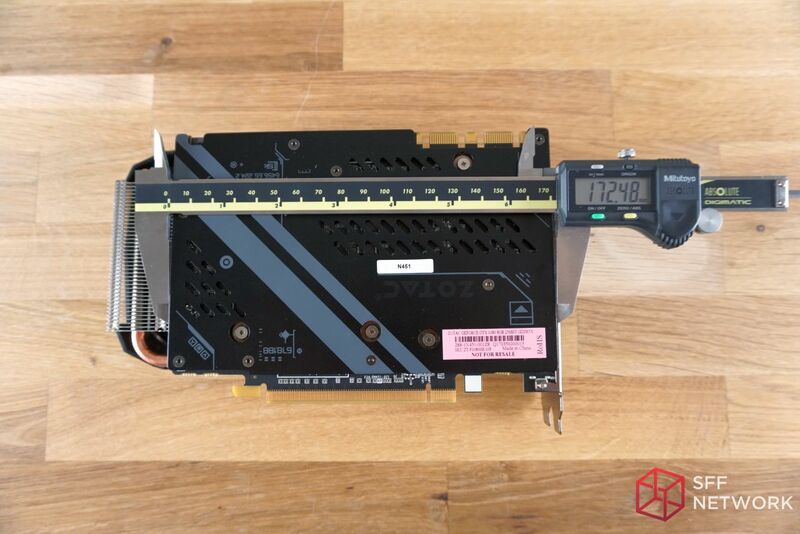 Slightly disappointing to see on this card, the 8-pin power connector appears to have additional room to be recessed into the PCB so that the 8-pin PCIe power connector would sit flush to the top of the PCB. I’m not entirely sure what the electrical keep out area is for this connector but even just a few millimeters deeper would make a big difference. The DVI connector is shielded and as usual, heatsink aside, it is the only reason why the card occupies 2 expansion slots at the back of the case. For anyone interested (and brave enough) in desoldering the DVI connector from the PCB, there appears to be plenty of room to play with even if you don’t have the most steady of hands. The test bench we have set up is a middle to high end system. This is designed to help showcase the kind of computer that would be considered attainable to most, without bottlenecking the GPU. 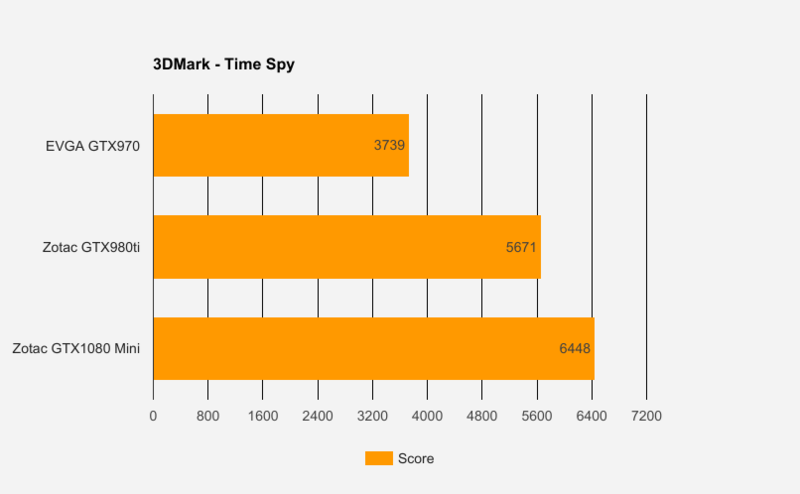 Synthetic benchmarks are an excellent way to utilize the full strength of a graphics card. 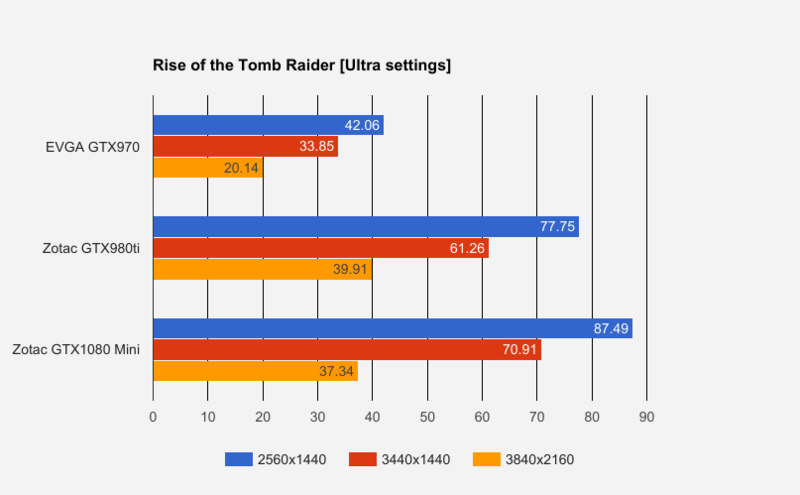 These tools help to showcase how powerful a GPU can really be, but are not an accurate representation of the kind of the performance you can expect in-game. It was 75.79% faster than the GTX 970. The ZOTAC 1080 Mini on average was 13.7% faster than the GTX 980 Ti. 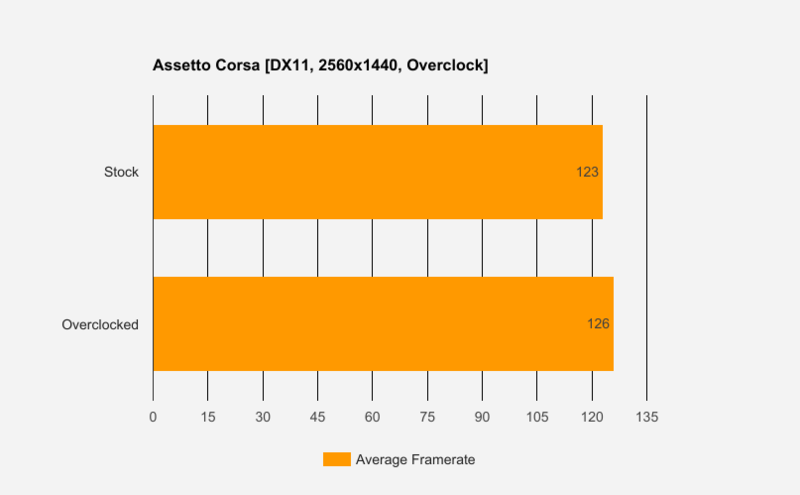 It was 72.45% faster than the GTX 970. 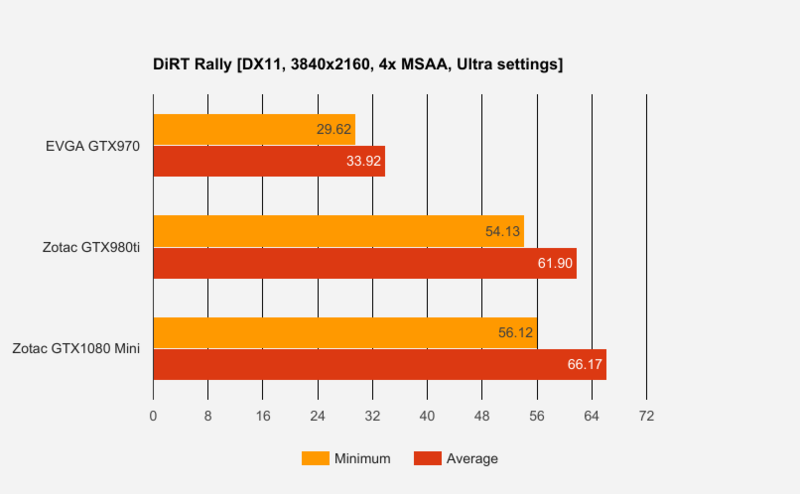 Based on the benchmark, the ZOTAC 1080 Mini on average was 8.36% faster than the GTX 980 Ti. 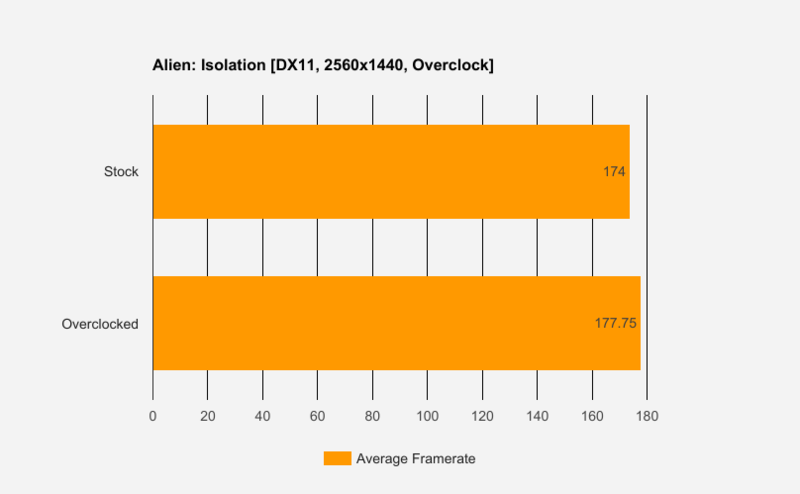 It was 78.15% faster than the GTX 970. 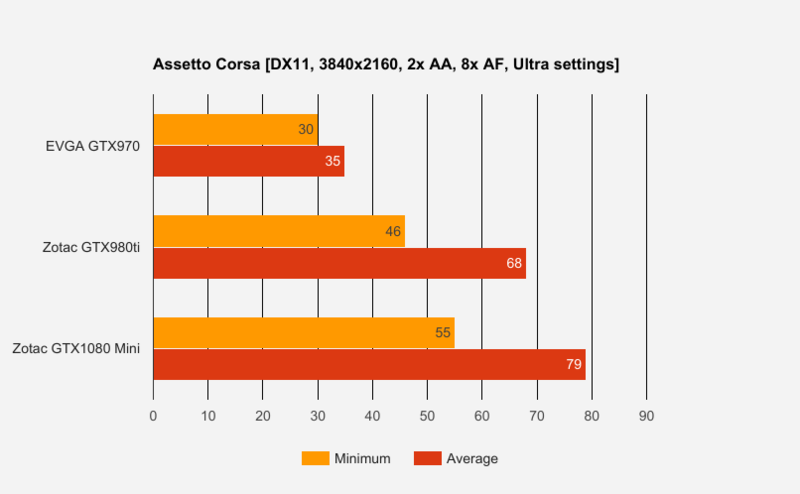 The ZOTAC 1080 Mini on average was 19.06% faster than the GTX 980 Ti. It was 75.33% faster than the GTX 970. 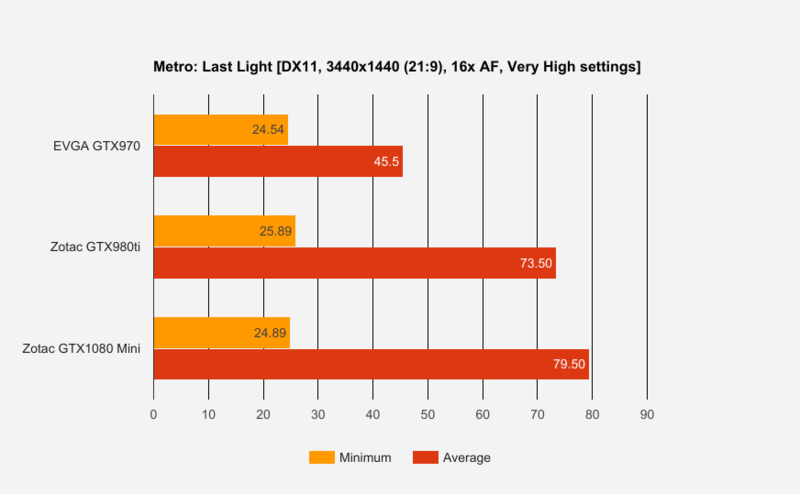 The ZOTAC 1080 Mini on average was 15.46% faster than the GTX 980 Ti. 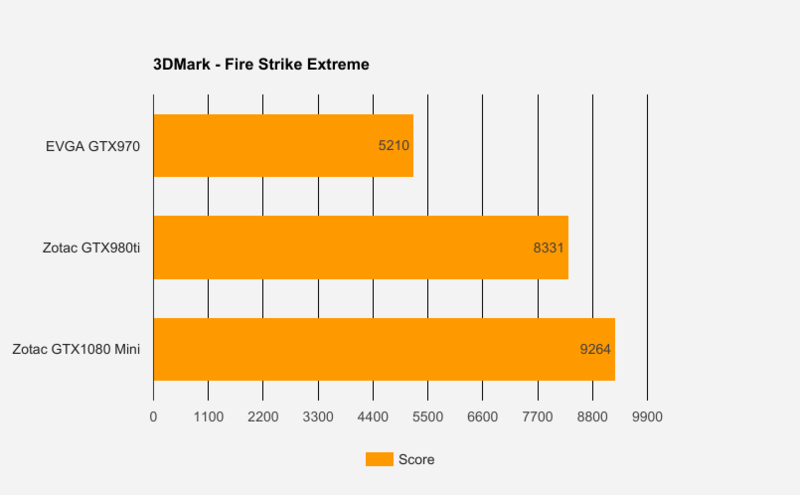 It was 92.39% faster than the GTX 970. 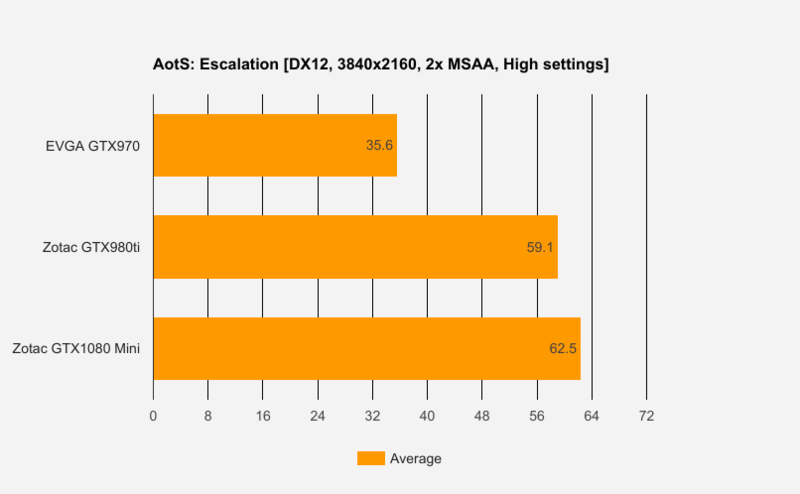 The ZOTAC 1080 Mini on average was 2.78% faster than the GTX 980 Ti. 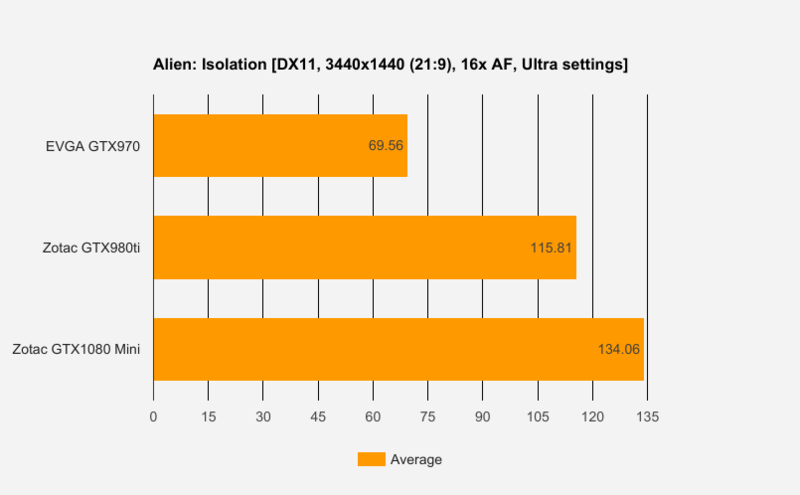 It was 44.70% faster than the GTX 970. The ZOTAC 1080 Mini on average was 16.17% faster than the GTX 980 Ti. 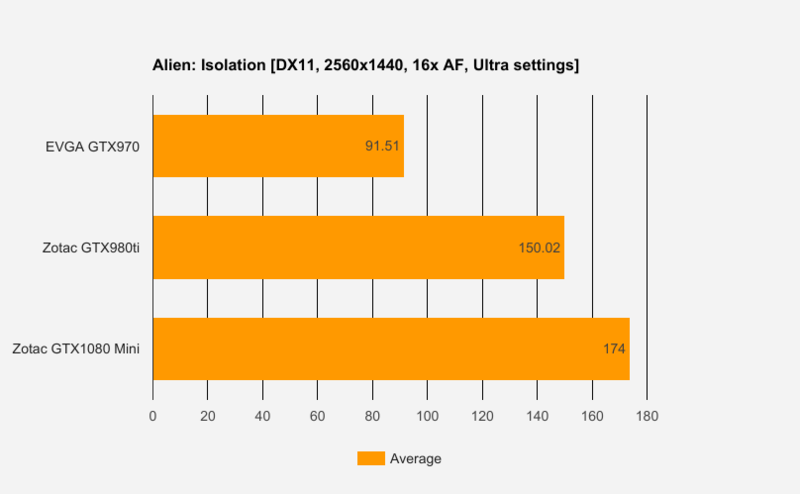 It was 104.75% faster than the GTX 970. 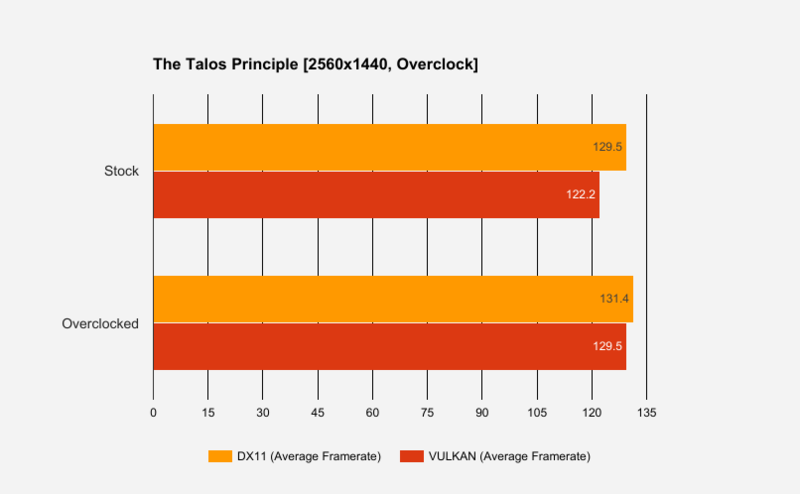 The ZOTAC 1080 Mini on average was 9.21% faster than the GTX 980 Ti. It was 87.96% faster than the GTX 970. 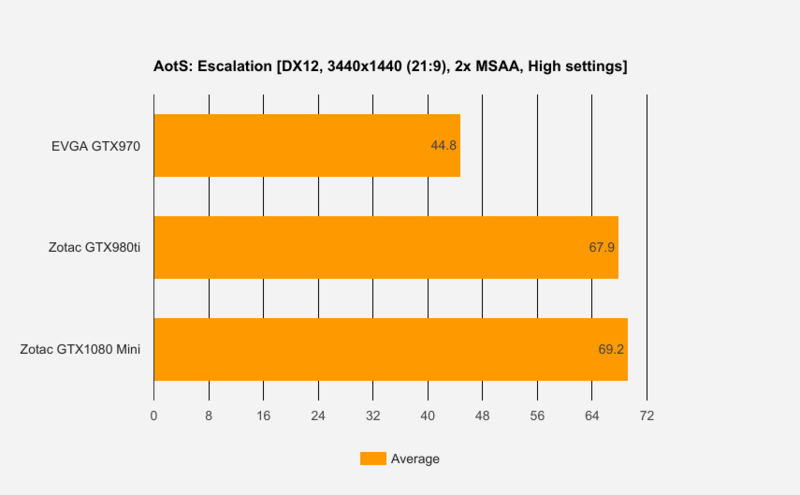 The ZOTAC 1080 Mini on average was 9.52% faster than the GTX 980 Ti. 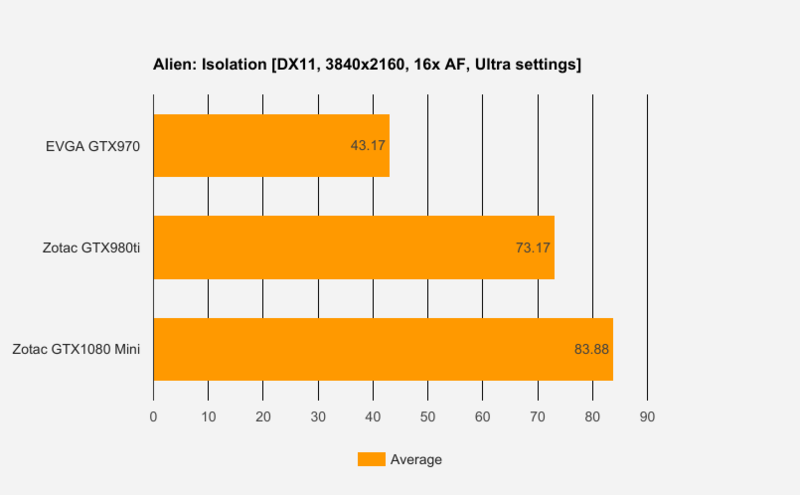 It was 81.44% faster than the GTX 970. 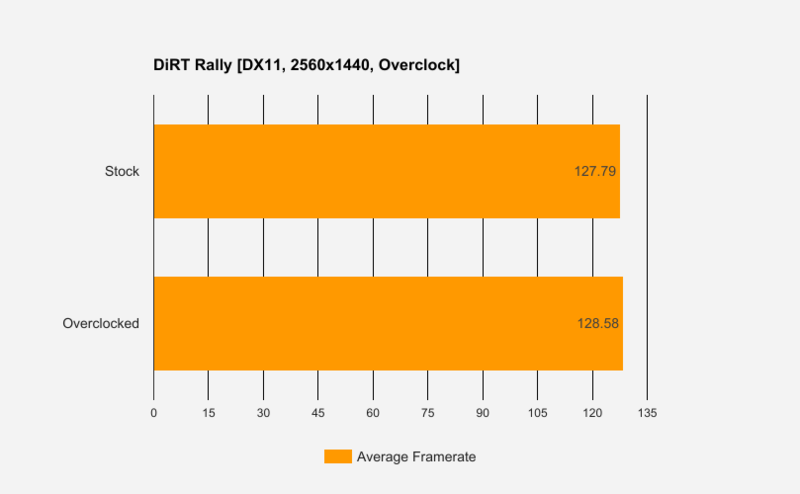 In DirectX11, the ZOTAC 1080 Mini on average was 13.42% faster than the GTX 980 Ti. 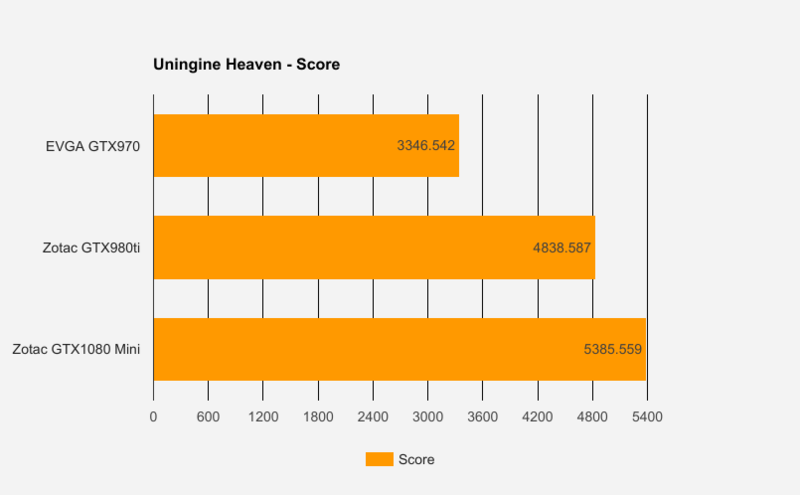 It was 98.44% faster than the GTX 970. 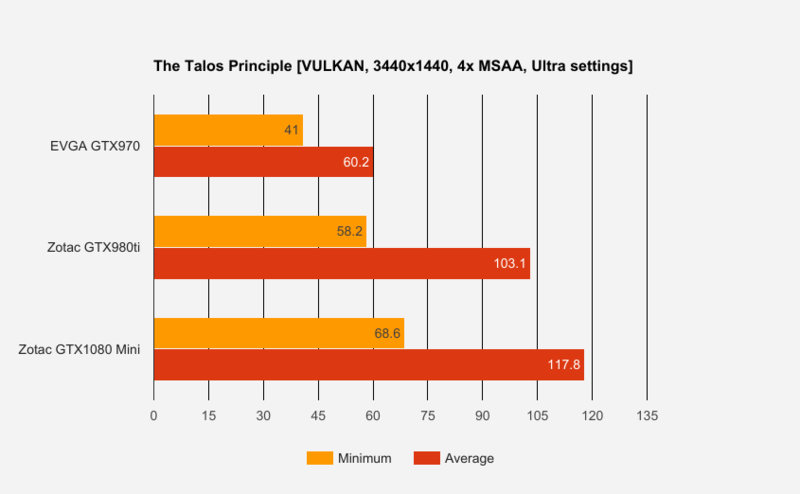 In Vulkan, the ZOTAC 1080 Mini on average was 13.59% faster than the GTX 980 Ti. It was 96.23% faster than the GTX 970. 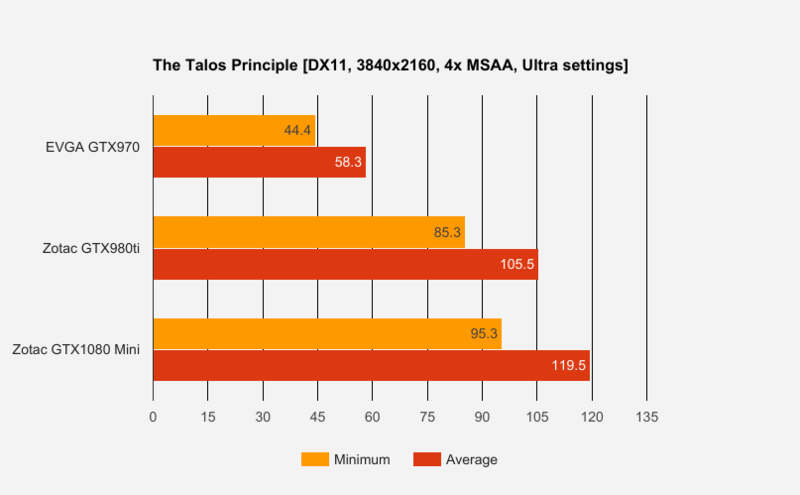 The ZOTAC 1080 Mini on average was 9.4% faster than the GTX 980 Ti. It was 103.79% faster than the GTX 970. 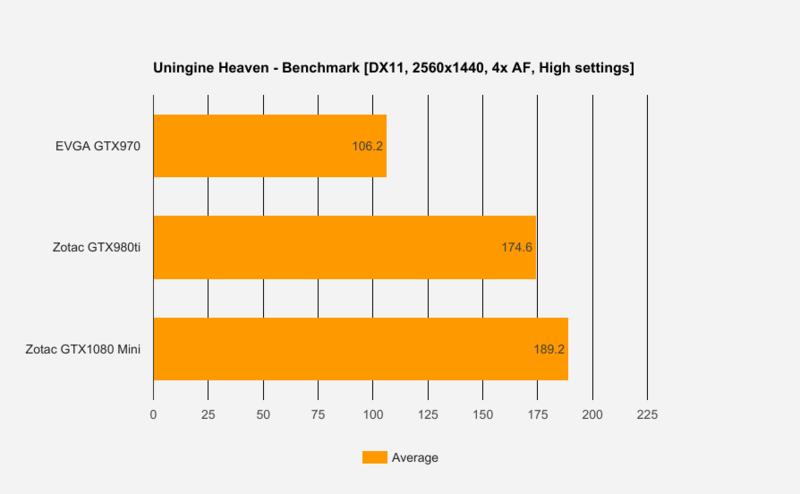 In synthetic benchmarks, the ZOTAC 1080 Mini on average was 12.78% faster than the GTX 980 Ti. It was 75.43% faster than the GTX 970. In game benchmarks, the ZOTAC 1080 Mini on average was 10.85% faster than the GTX 980 Ti. 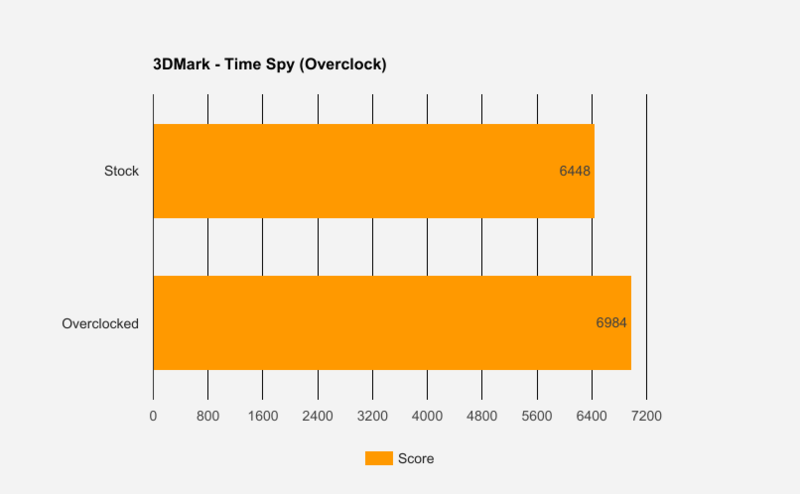 It was 87.63% faster than the GTX 970. On the test bench, the noise levels for this card were quite impressive, especially for a card of this size. 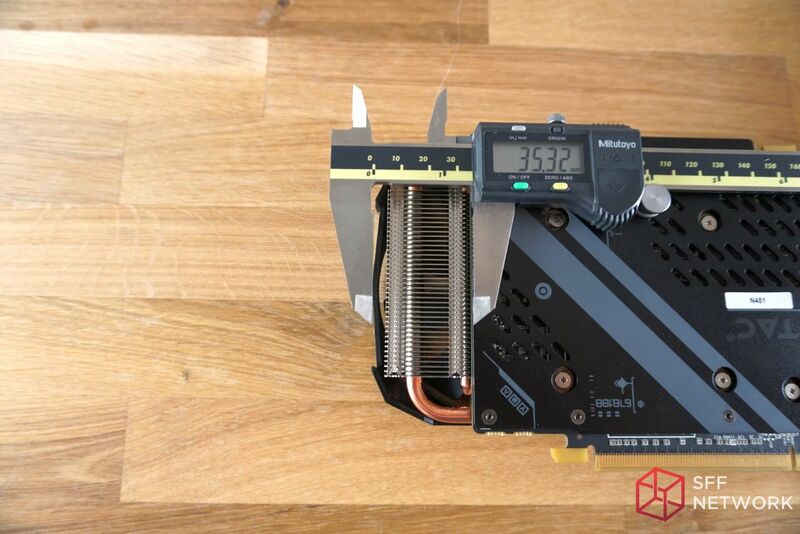 When I had the test bench setup approximately 2′, or around 61cm from my current seating position, the fans were just barely audible at idle and entirely within the range of, “Wow, that’s still impressively quiet!” at load. 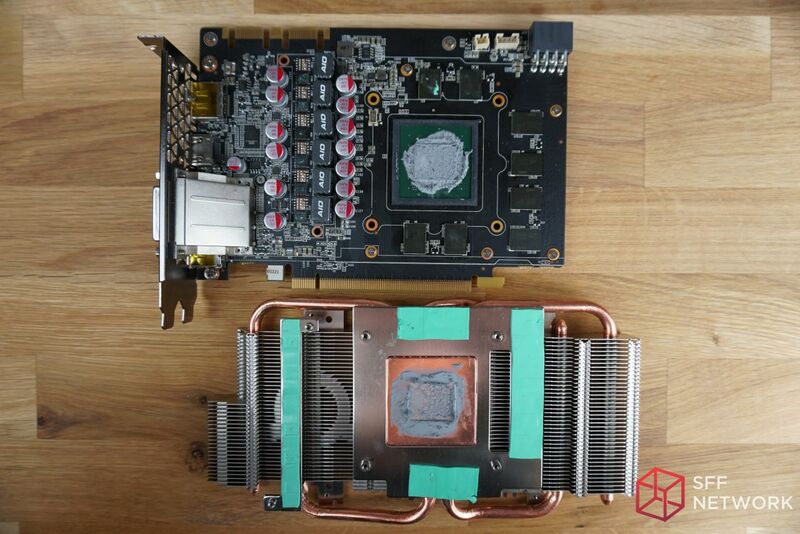 Both the GTX 970 and GTX 980 Ti were louder than the ZOTAC 1080 Mini in testing. However, when stuffed into a tiny case (and once the GPU surpassed ~70 degrees Celsius) the 1080 Mini’s fans would ramp up swiftly, causing a slightly obnoxious tonal reverb. 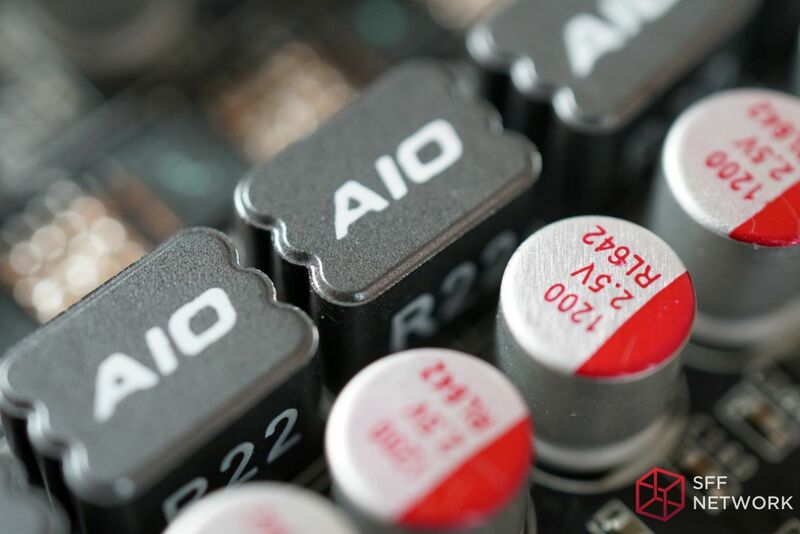 The best analogy I can use to describe the sound would be like a slightly unbalanced case fan. It wasn’t unbearable but it was no longer what I would consider a pleasant fan hum. If you’re an open headphone user, you might barely notice the fan noise in the background but over time, depending on how sensitive you are, you may find it slightly annoying. I will admit though, I was a little disappointed to discover that ZOTAC has opted not to support a semi-fanless design like other Pascal based GPUs. 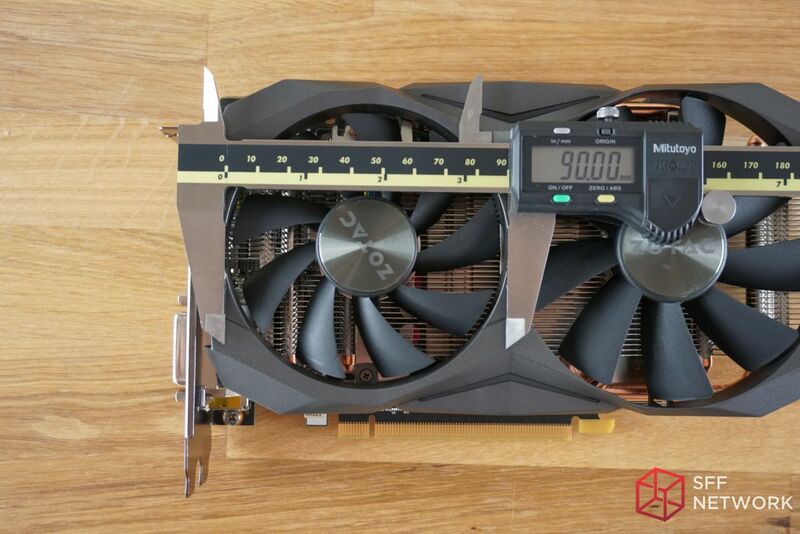 I am going to guess that this is a result of trying to keep the card as small and affordable as possible but none the less, the fans are always on as silent as they may be (under ~70c). 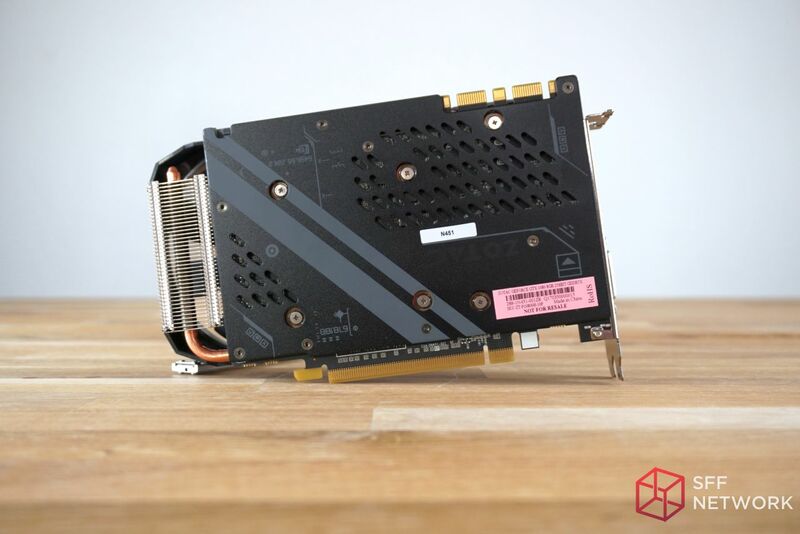 The thermals for this card were decently impressive for an enthusiast-grade graphics card that has been shrunk down to this size. 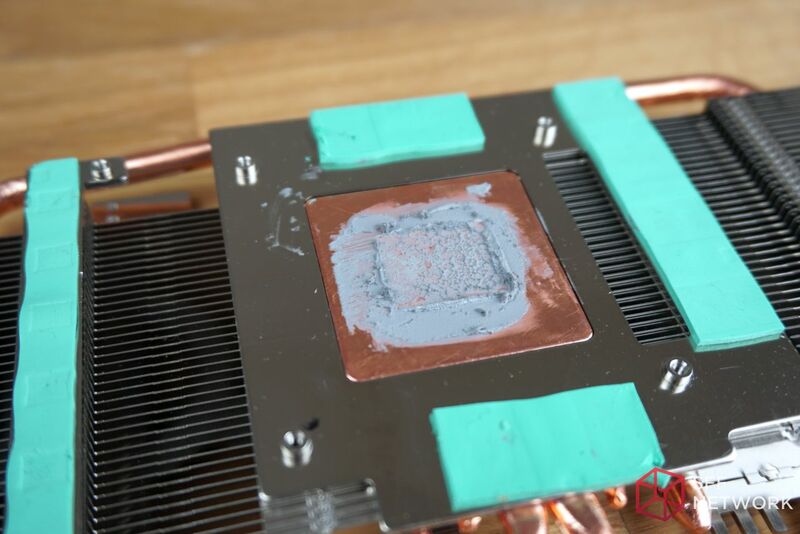 On the test bench, the highest temperature recorded was 69c (non-overclocked). 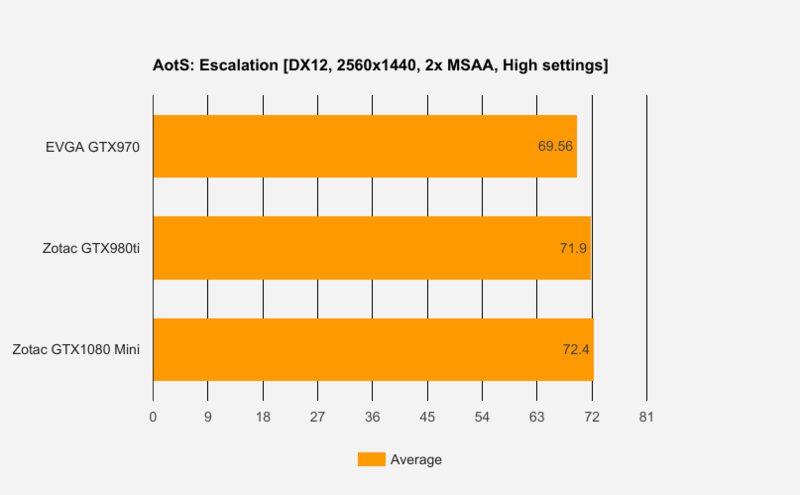 Under high stress loads inside a case, the highest temperature was 74c (non-overclocked). Overclocking the card had very little impact on the temperature. To illustrate how well the heatsink was capable of dissipating heat, I recorded a short video using a Seek Thermal CompactPro. 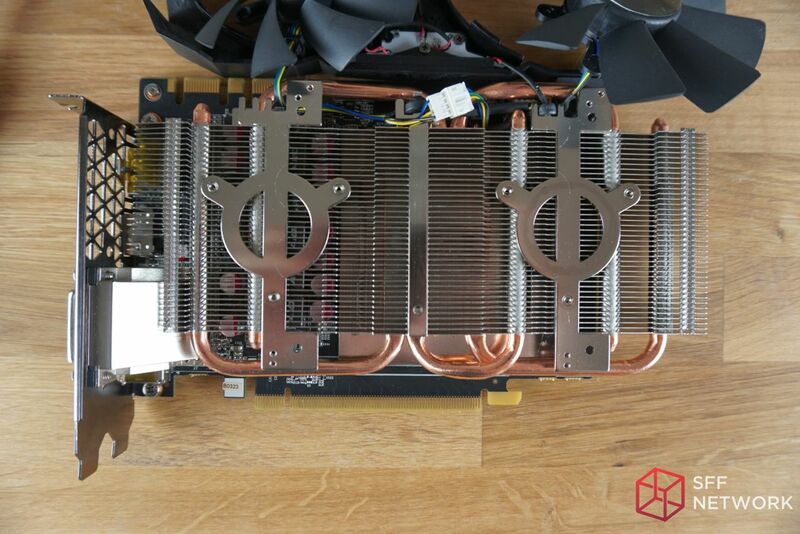 During this video, the highest internal GPU temperature recorded was 69c. 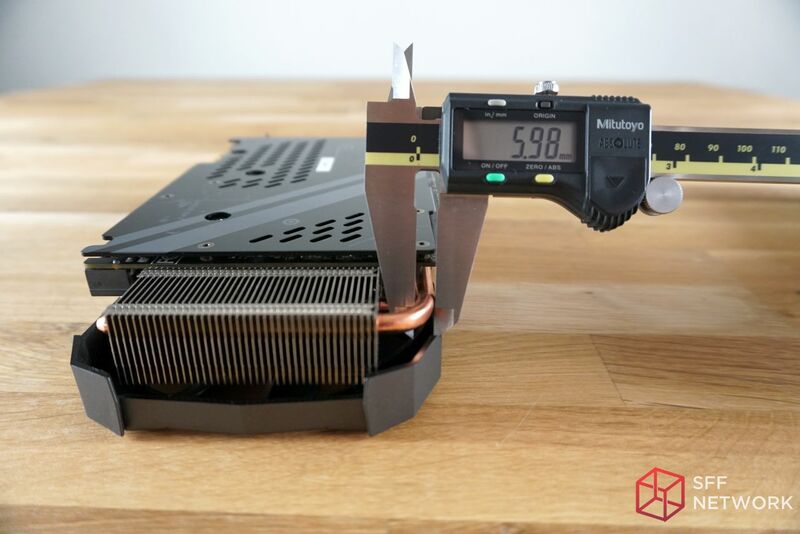 As you can see, if you absolutely need to cut off some of the excess heatsink to be able to fit the 1080 Mini into your favorite chassis, I don’t think that would be an issue. If you have a cramped case, as many SFF enthusiasts do, I think it’s safe to say that this GPU is better suited in a case with decent ventilation. That being said, if you’re comfortable with adjusting the the fan curve, there is more than enough headroom afforded by the beefy heatsink to reduce the speed of the fans throughout the temperature range. 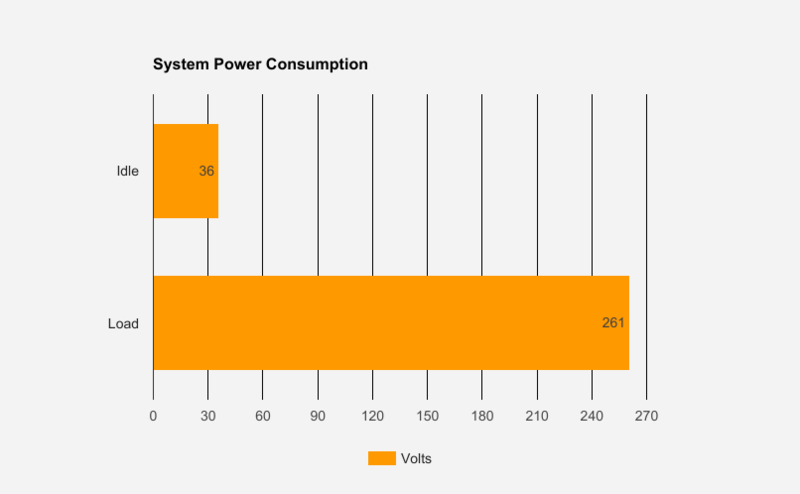 Power Consumption was measured by plugging the test system into an unoccupied CyberPower CP1500PFCLCD PFC Sinewave UPS 1500VA 900W UPS. Accurate to within a single watt and able to display values in real-time, it’s the most accurate tool that I have for this job. 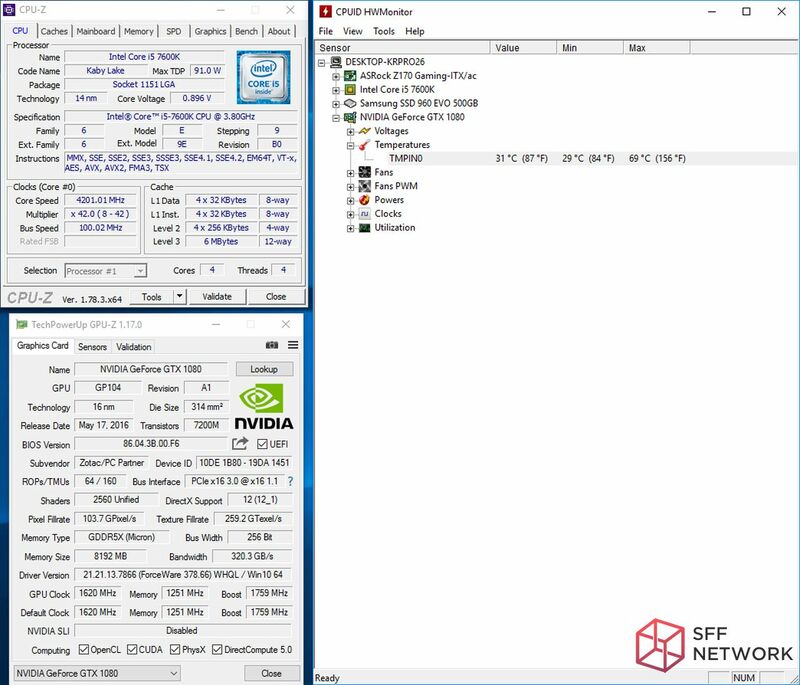 In increments of 25MHz, I slowly overclocked the GPU using EVGA Precision XOC and ran several stress tests to ensure stability. Once I happened upon even the slightest artifact or hint of instability, I backed the card down 25MHz until I found a frequency that could be maintained throughout testing. The end result is a 200MHz overclock, not astronomical but certainly respectable on a card where overclocking wasn’t its first priority. 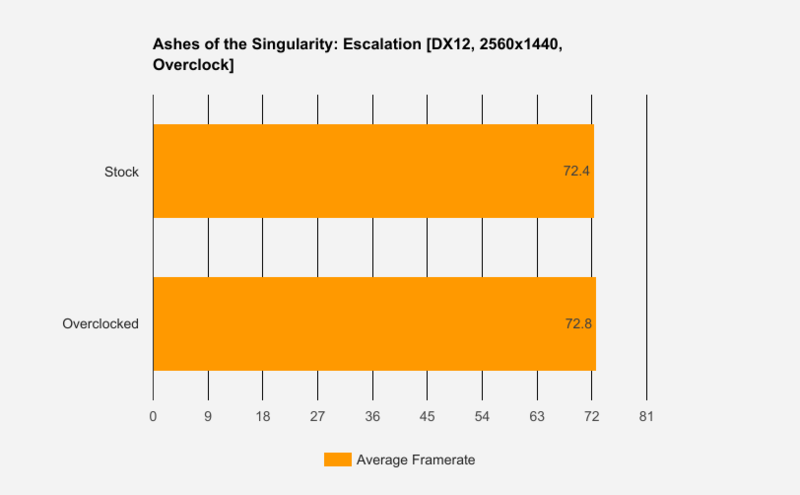 All games were benchmarked at 2560×1440 resolution, arguably the most common resolution of the three we benchmarked. 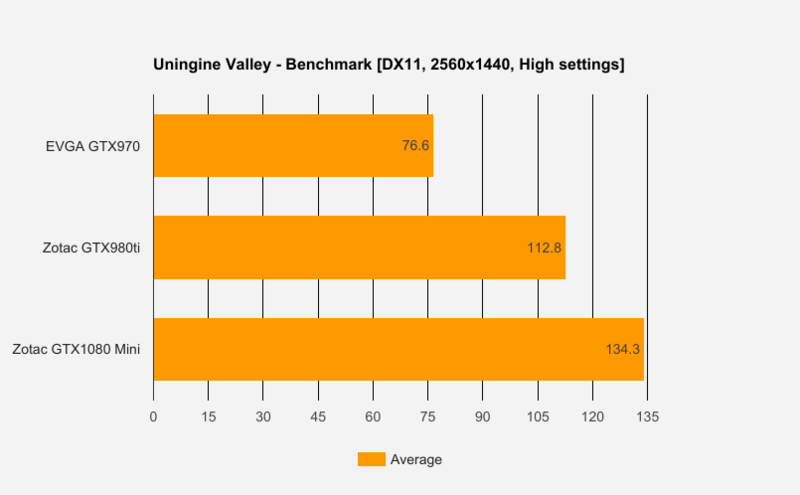 In synthetic benchmarks, an overclock of 200MHz netted an average additional 6.33% in performance. 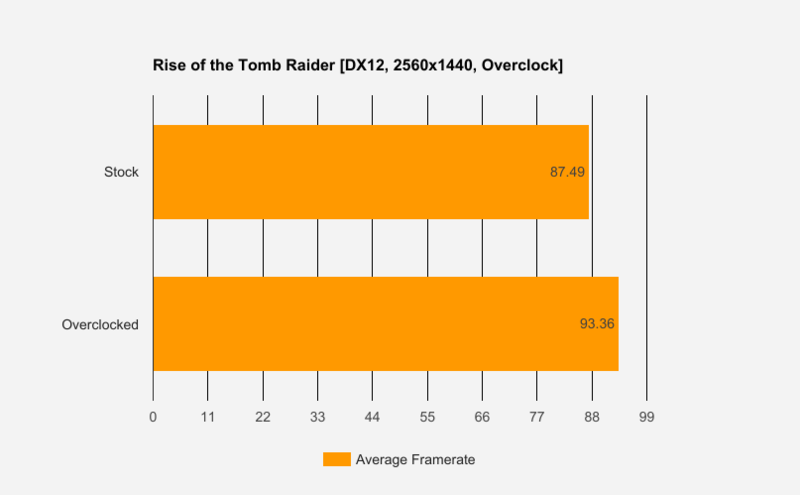 In game benchmarks, an overclock of 200MHz netted an average additional 2.62% in performance. I define “Pros” as things that I really liked about the GPU; things that made me sit back and really appreciate the quality or how unique the product is. 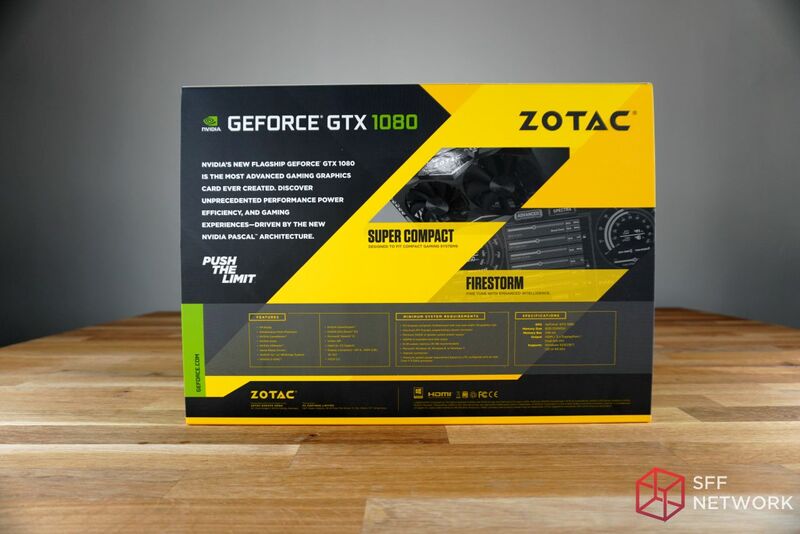 The ZOTAC 1080 Mini is an extremely well-designed and terrific looking card that can handle absolutely anything you throw at it. The best part is that it can do all that and still fit into the some of the smallest of cases. 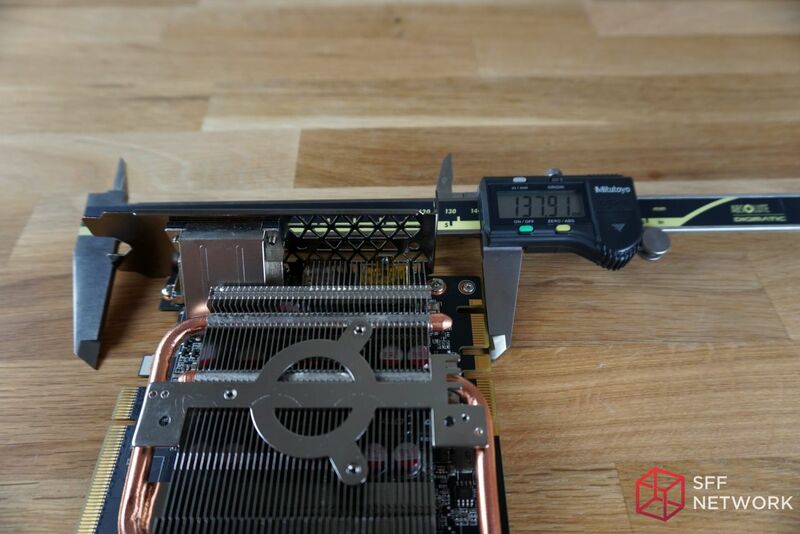 On our bench, the GPU was capable of a decent 200MHz overclock without much effort and the heatsink does a terrific job keeping the GPU temperature down. I really liked (and appreciated) the extra attention to detail that I feel other manufacturers would have neglected. 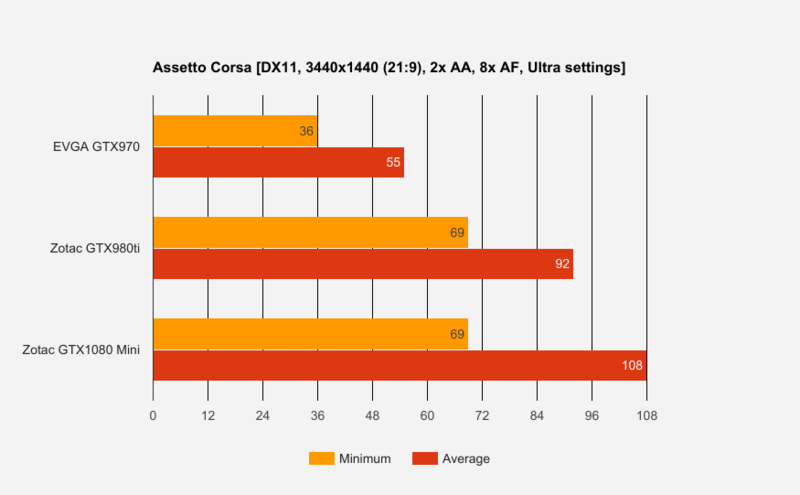 The card has a 5 year warranty once it is registered with ZOTAC (2 year warranty offered without registering). 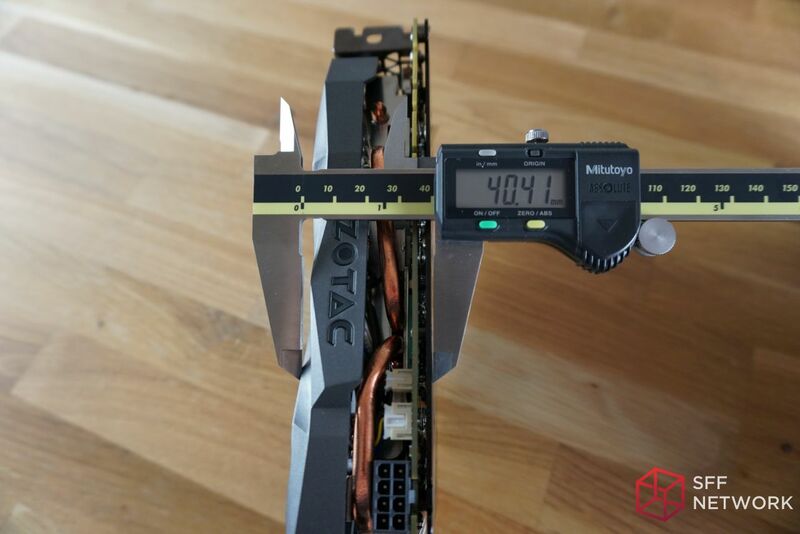 It costs a considerable amount of R&D to create such a unique GPU so major kudos go out to ZOTAC for taking that leap when no one else would. If possible, I would like to see the 8-pin power connector recessed further into the PCB so that the inserted power cable would sit flush to the top. I would have liked to see the semi-fanless feature available on this card but with the fans being so quiet at idle, it’s not a deal-breaker. If my IR measurements are any indication, I believe that a slightly shorter version (1080 MINIer?) 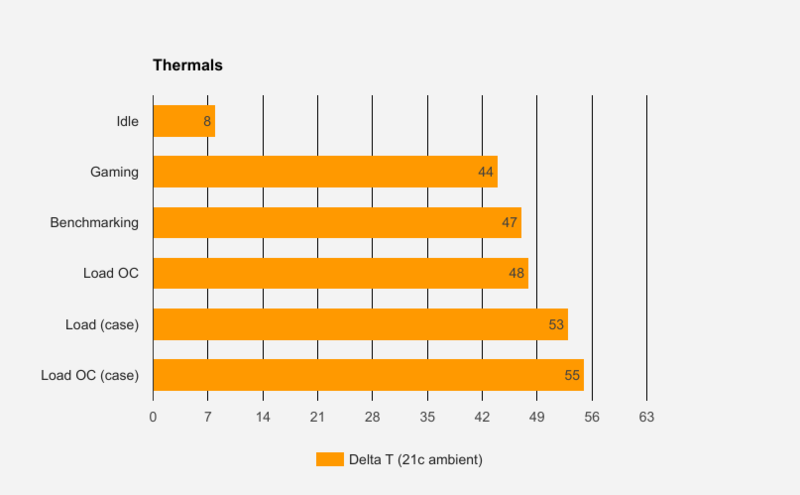 could have been possible without sacrificing thermal performance. 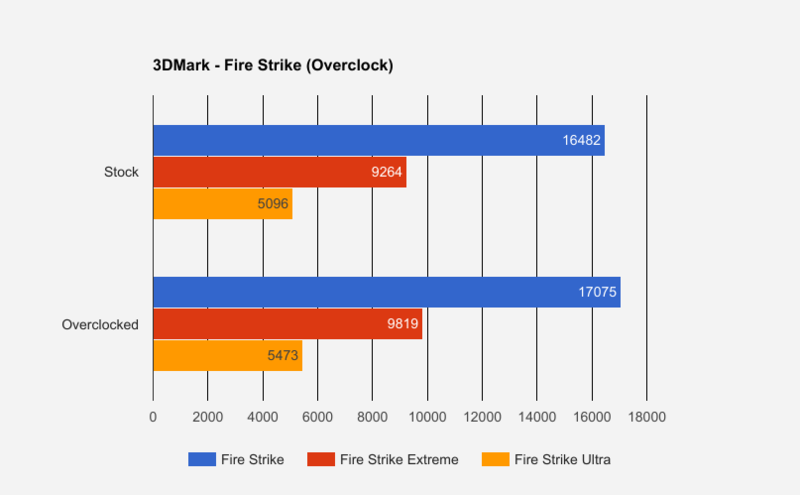 The overclock is likely being bottlenecked by the 5+1 phase design. 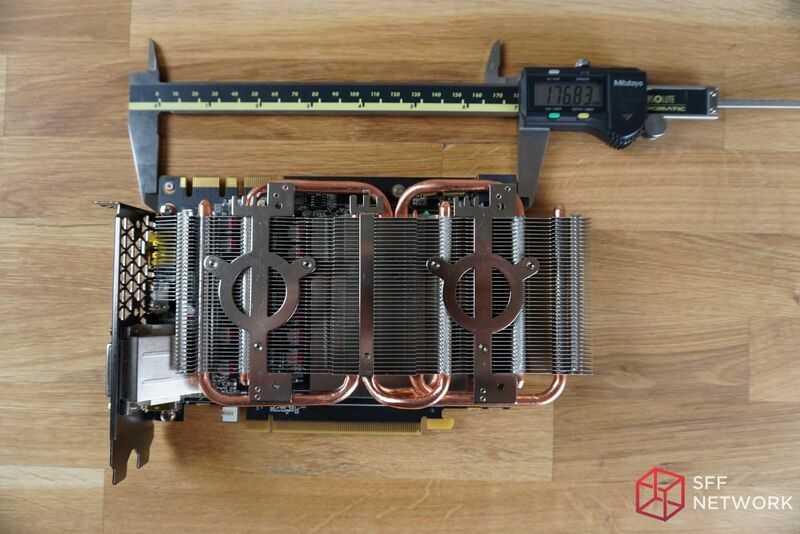 While I understand that this card isn’t built for the overclocking market, an improved power delivery system over reference, while more expensive, would have made a big difference. 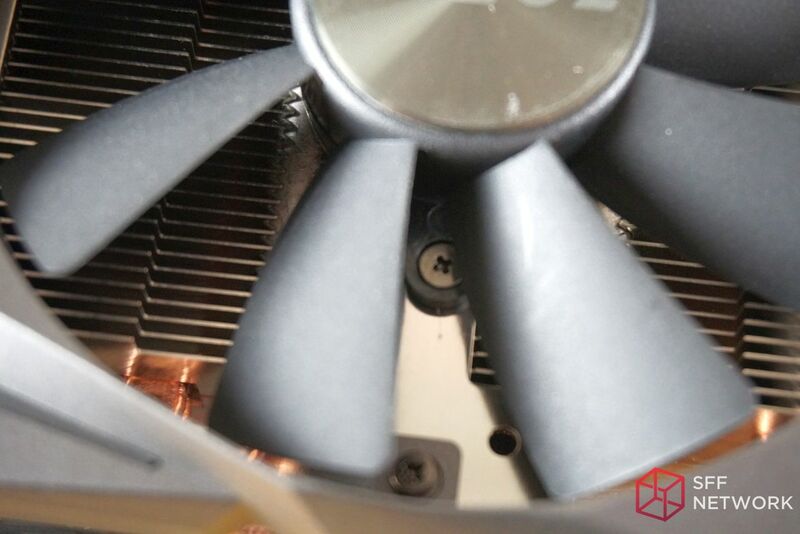 For anyone daring enough to remove the stock fans and shroud, the entire heatsink needs to be removed from the PCB in order to disconnect the fan headers. 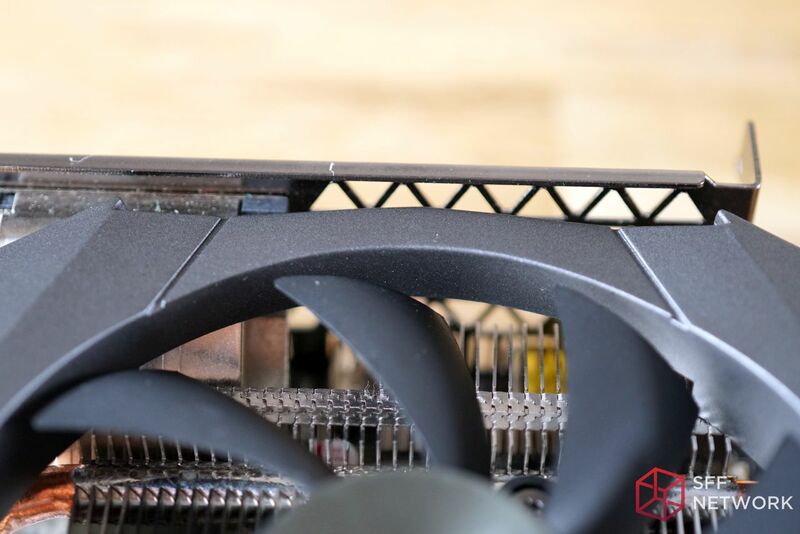 I know that this isn’t a normal activity for most consumers but if the headers were facing 90-degrees outwards, they would be far easier to disconnect (especially if the series of fans required manual replacement well after the warranty expired). Finding a con was really difficult with this card when it does so much right. Unfortunately, I did find a relatively small con, and it has to do with the irregular fan noise that occurred past ~70c. At lower temperatures the fan is impressively quiet but at higher speeds there is a slightly obnoxious tonal reverb that noise sensitive users will find annoying. 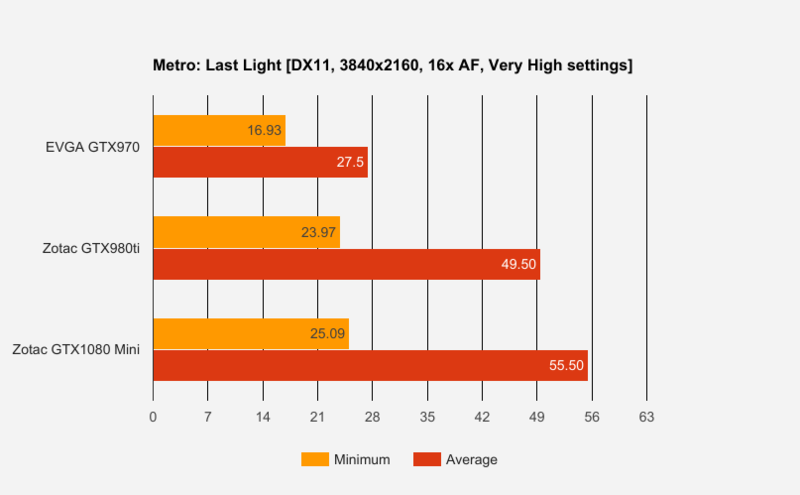 The conclusion: At present, the ZOTAC 1080 Mini is the undisputed King of SFF graphics cards. 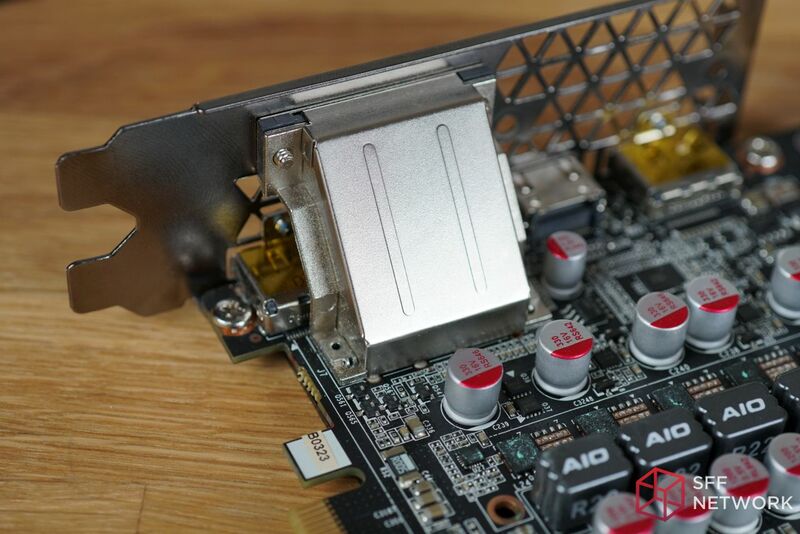 If you want to build the most compact system without compromise, this is the card to get. It’s lightning fast and provides plenty of horsepower to last you for several years while DX12 continues to mature. Overall my experience with the card has been nothing short of impressive. It will be interesting to see if any other manufacturer will rise up to challenge ZOTAC on their home field. 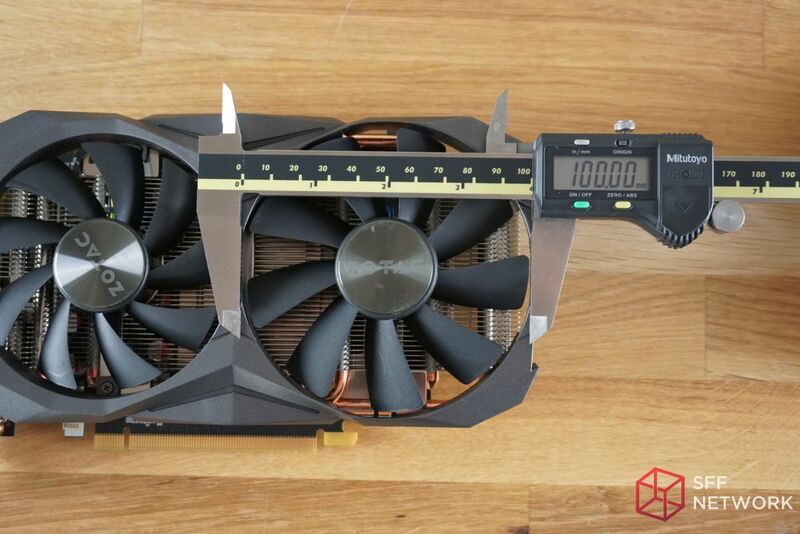 Please let us know what you think about the ZOTAC 1080 Mini on the forums here.